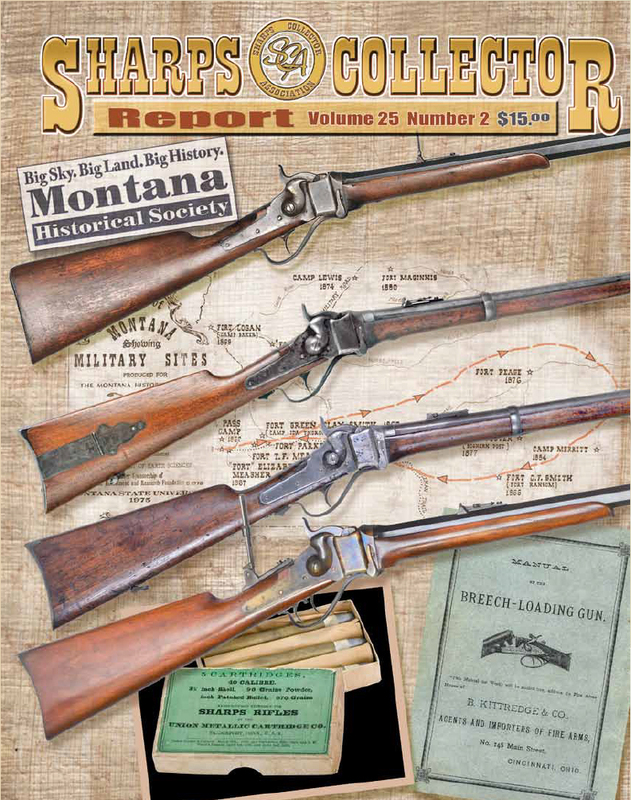 We have a complete selection of back issues and encourage everyone to buy the issues that cover their collecting interests or to complete their sets. 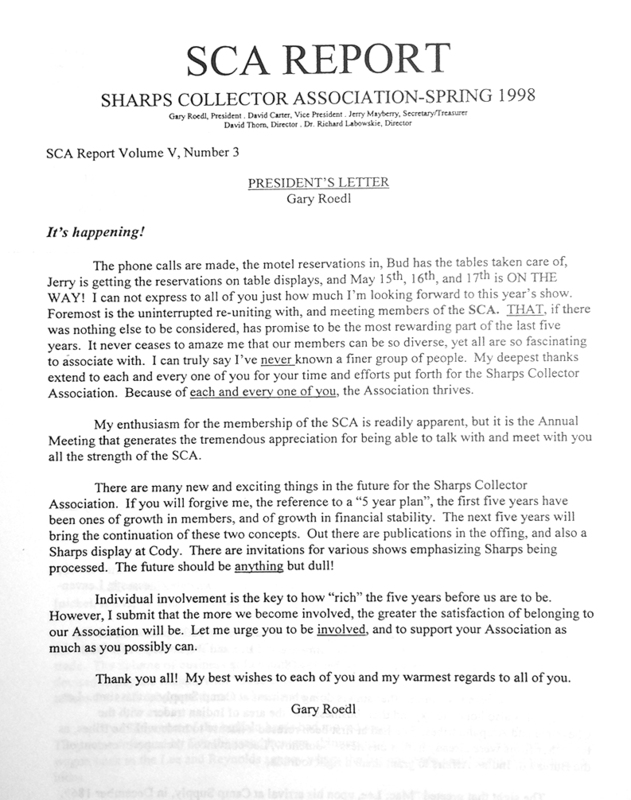 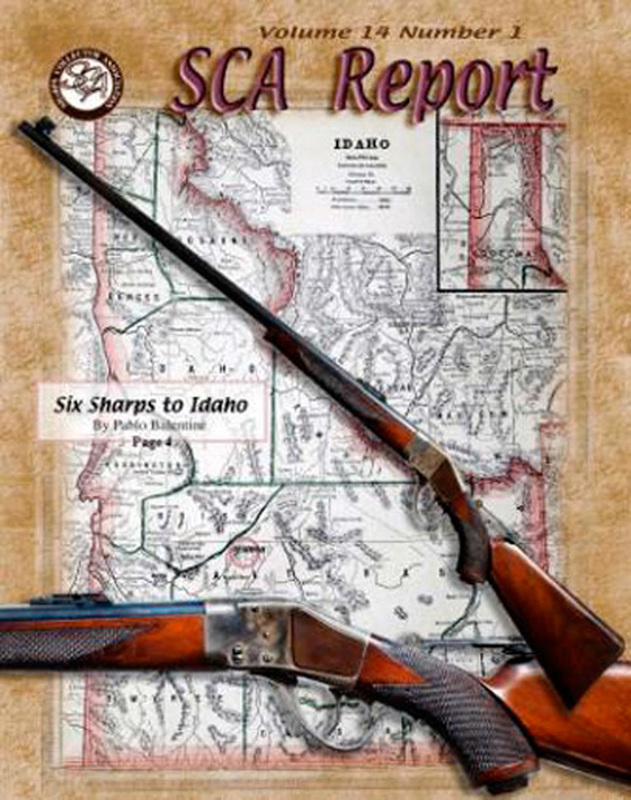 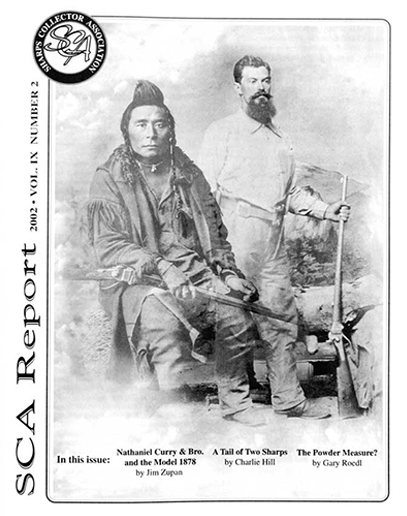 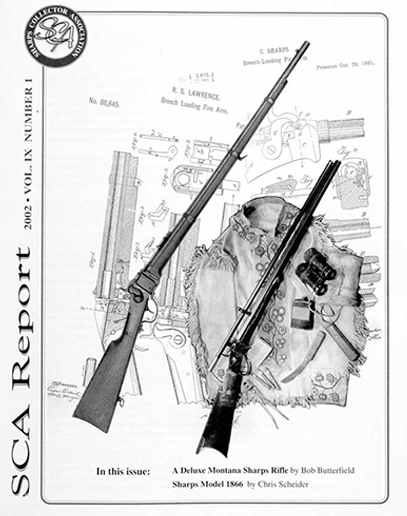 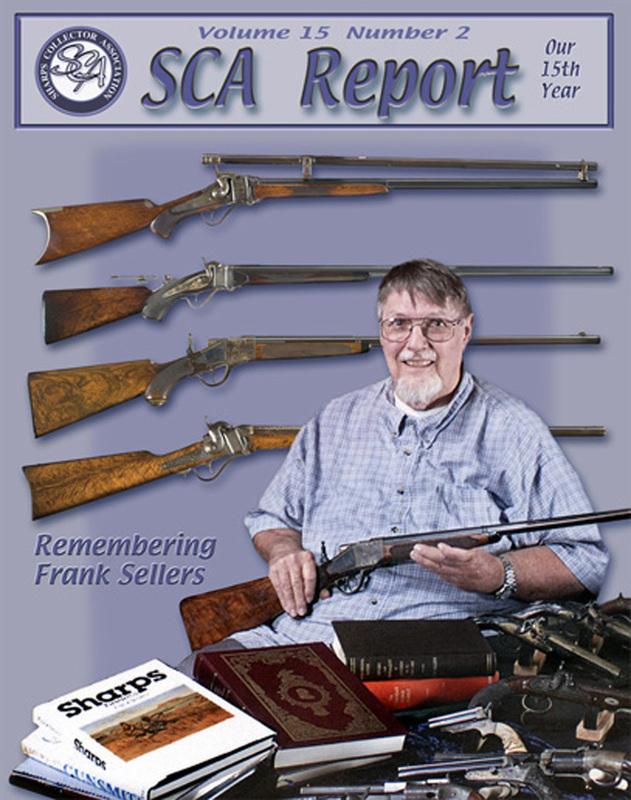 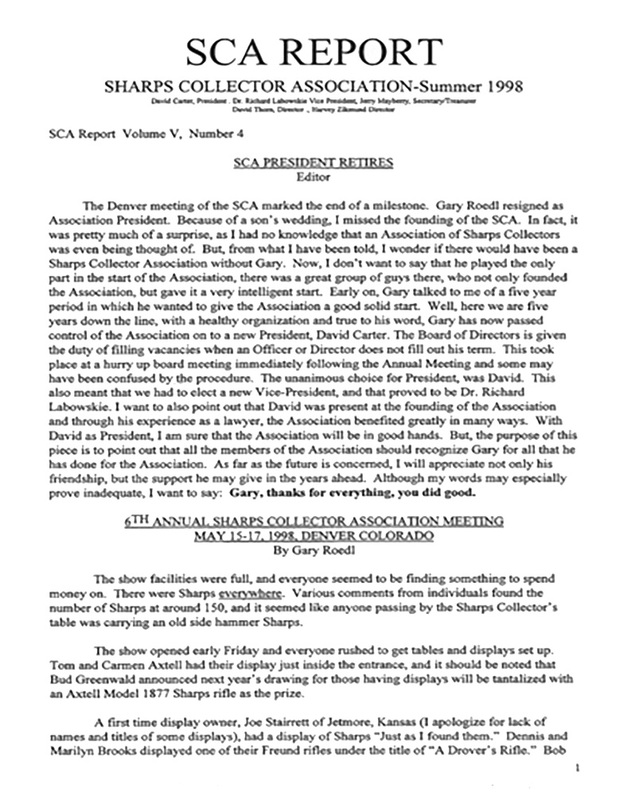 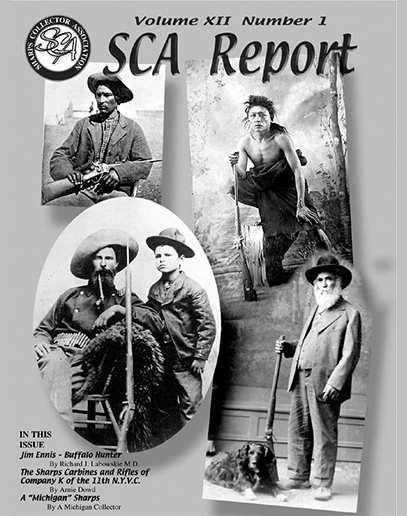 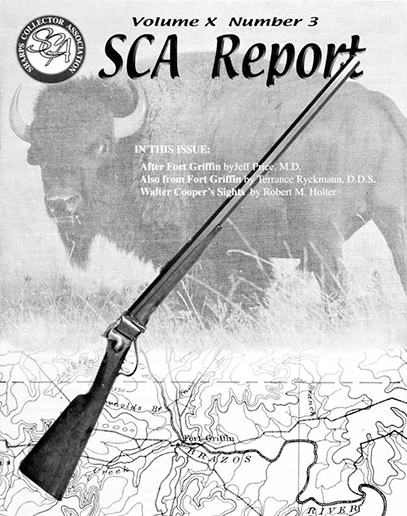 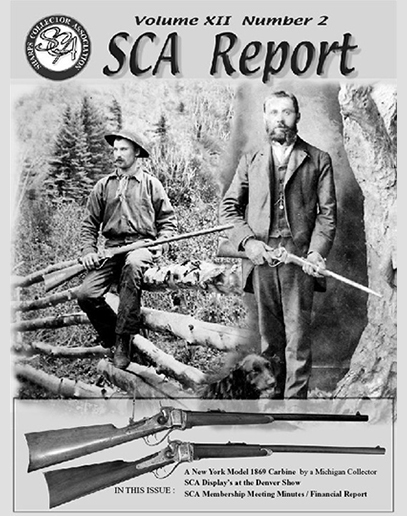 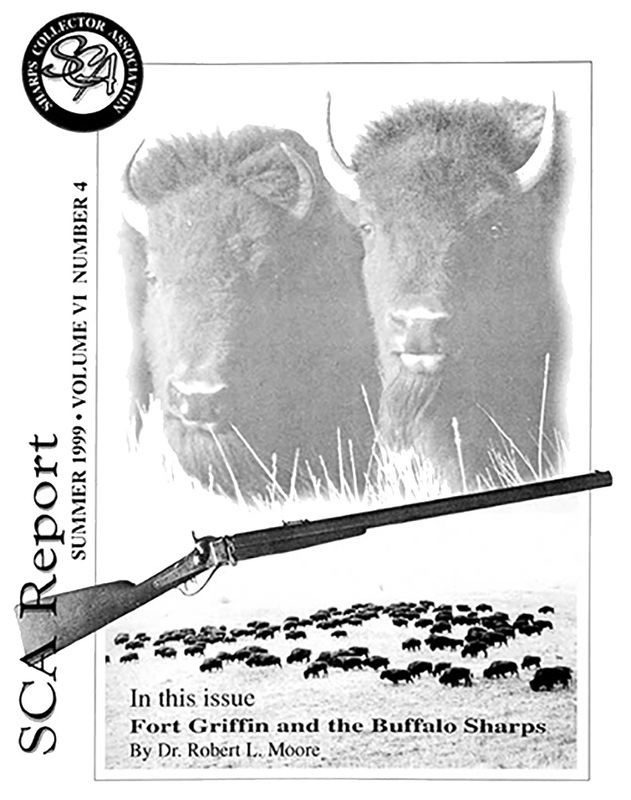 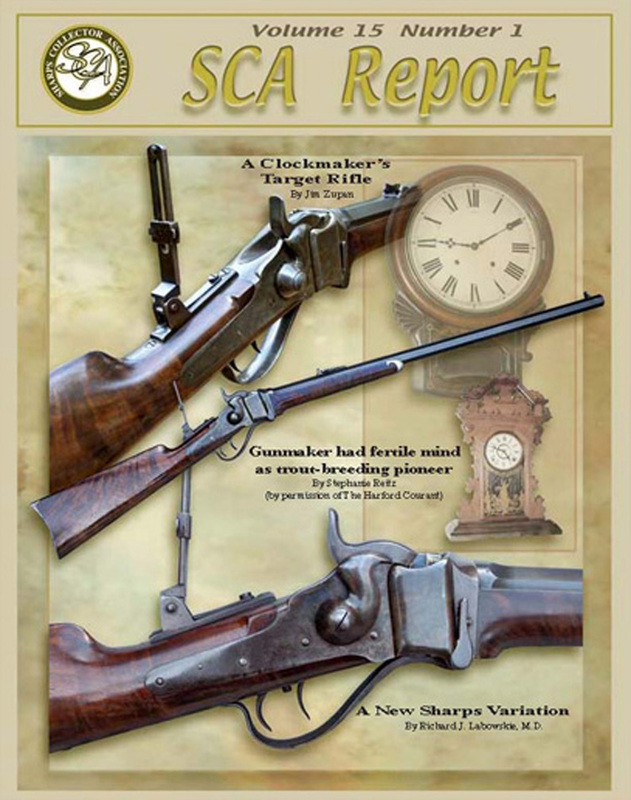 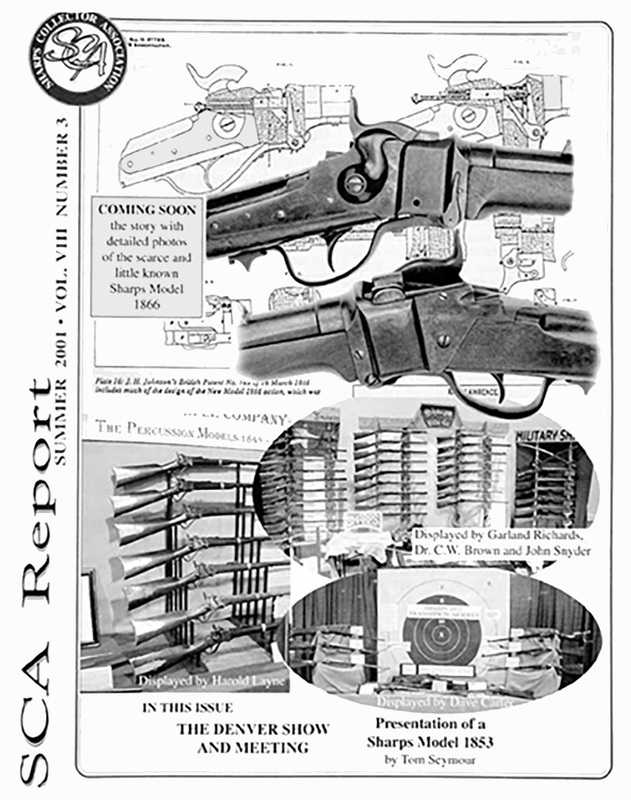 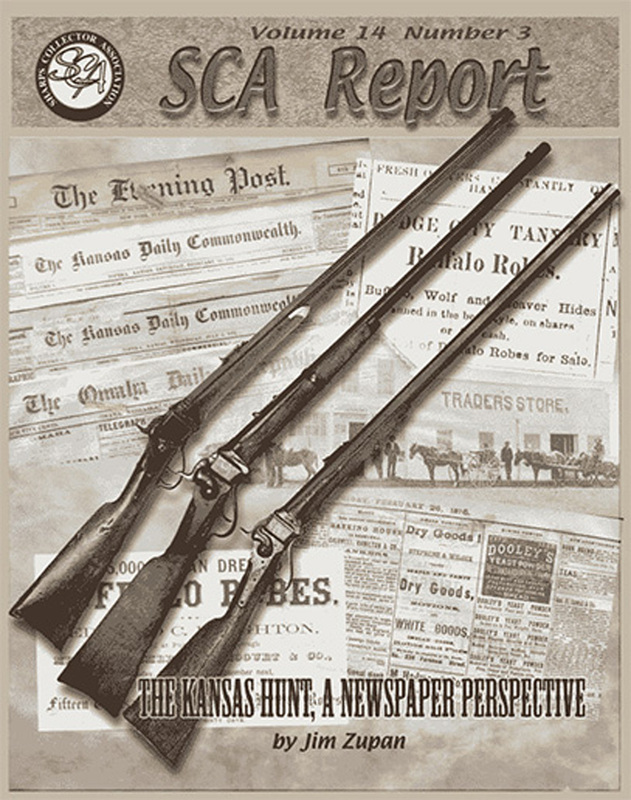 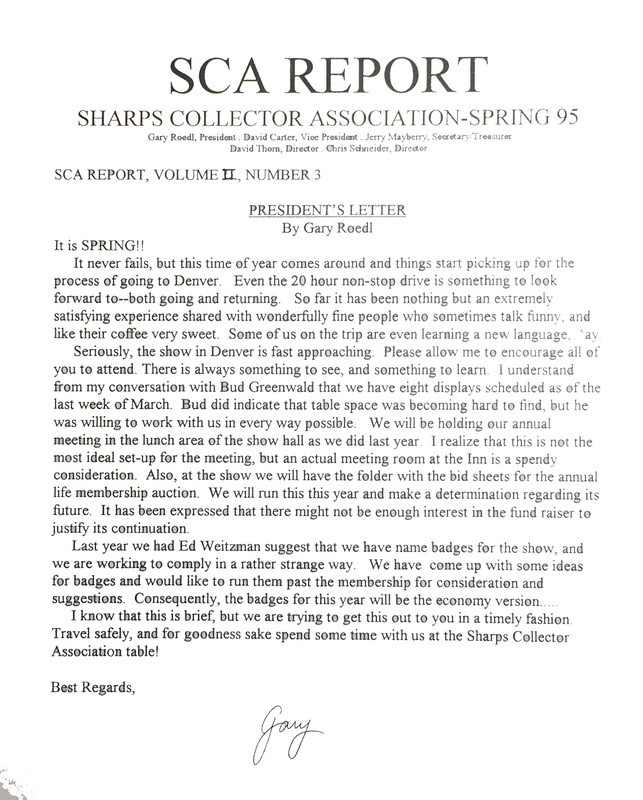 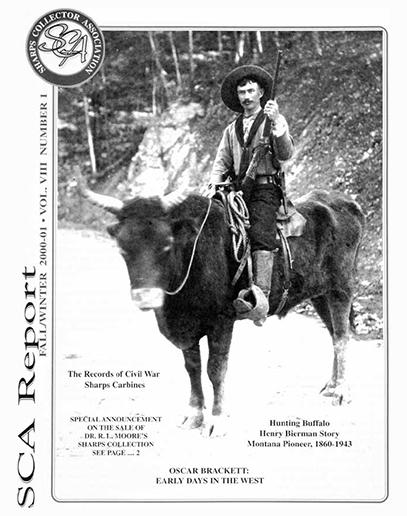 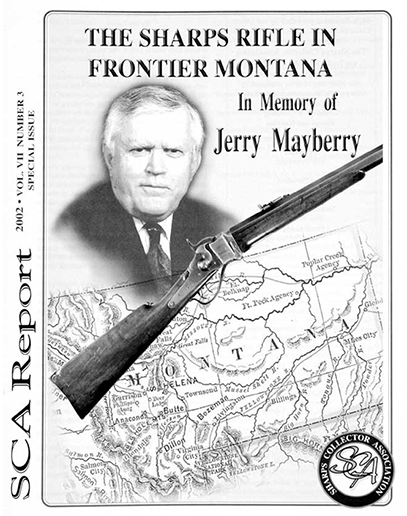 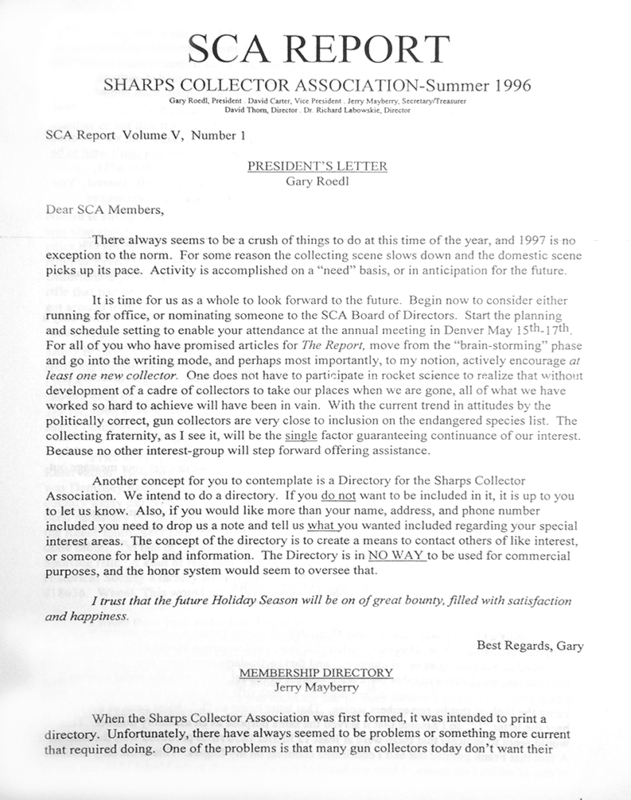 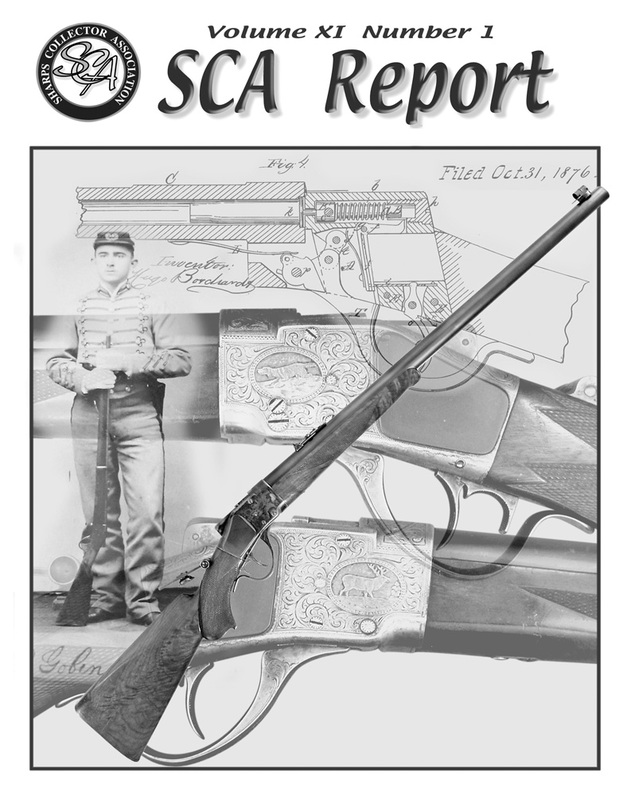 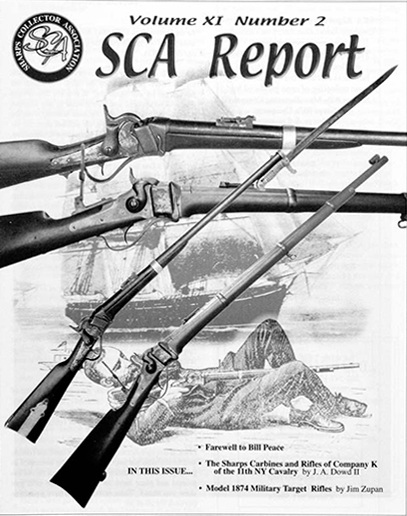 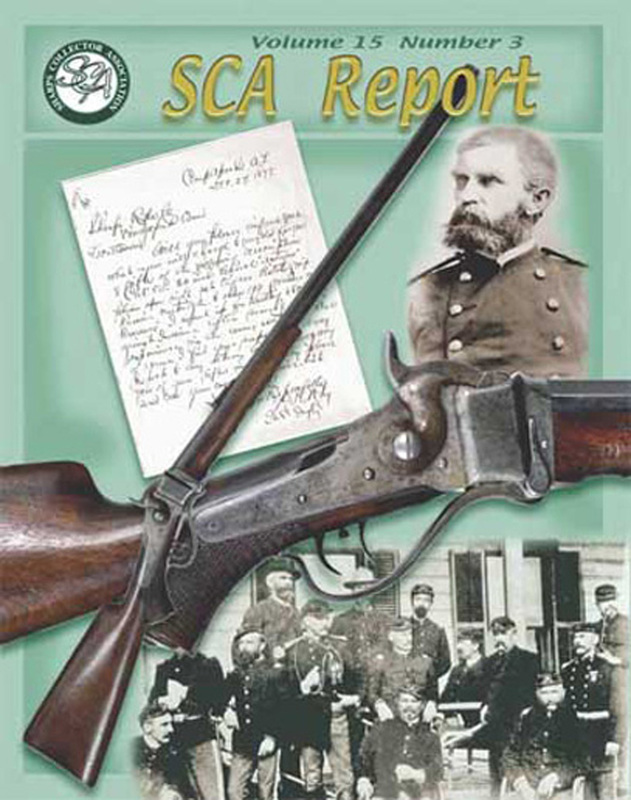 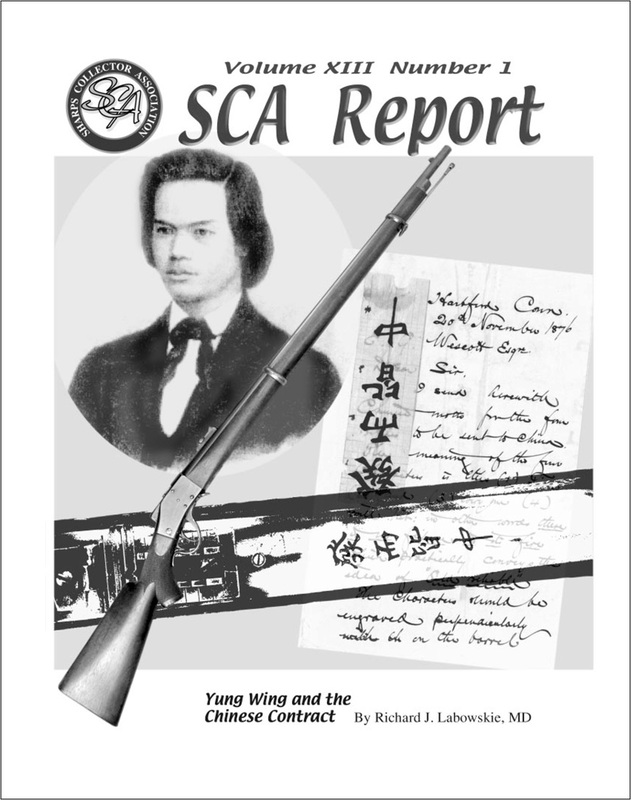 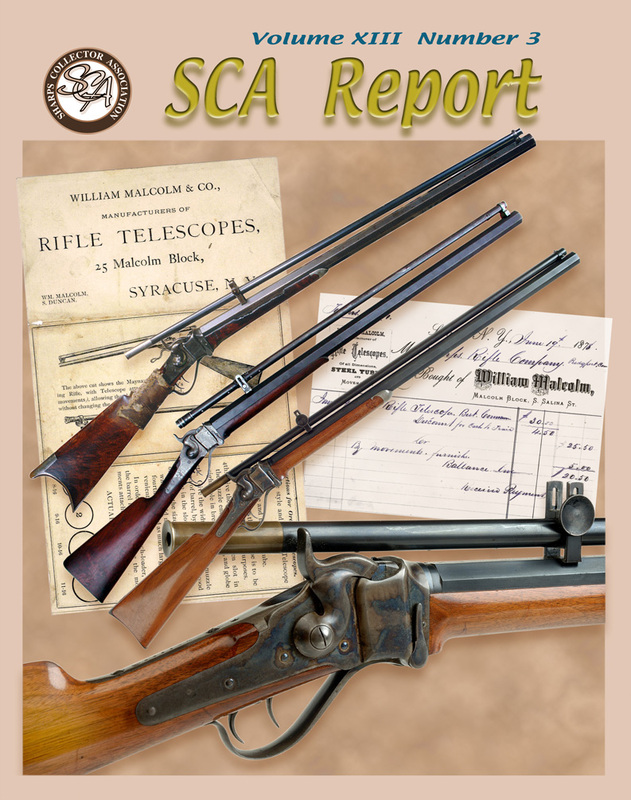 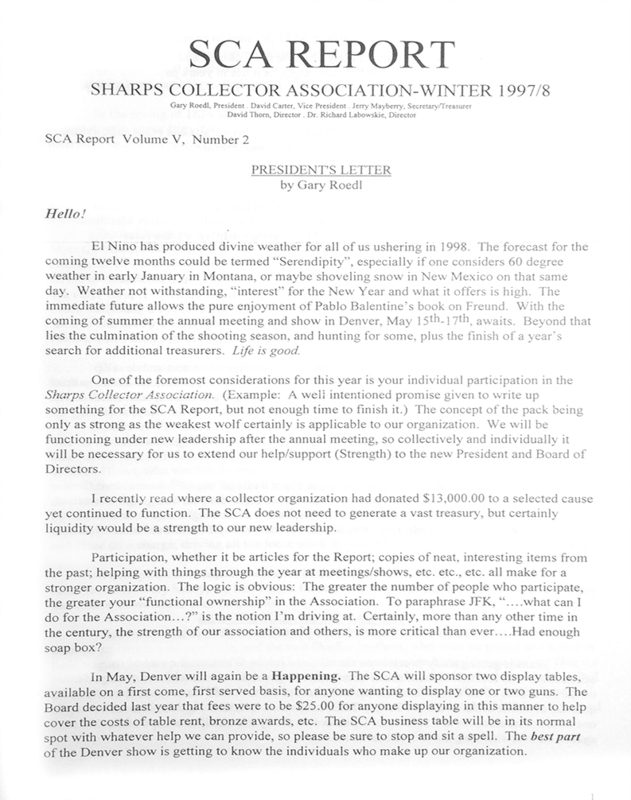 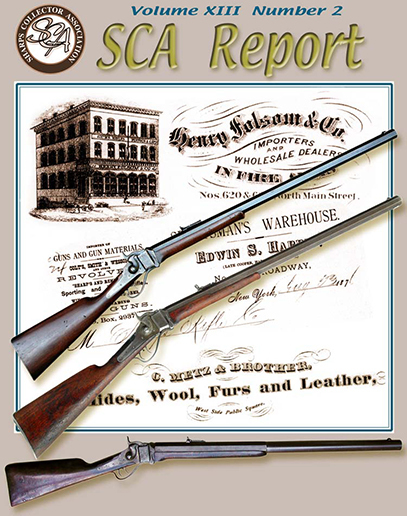 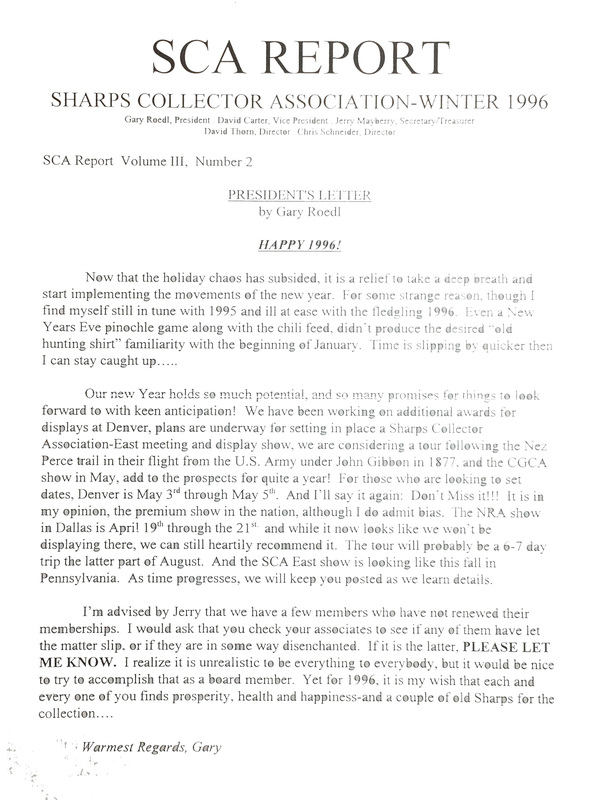 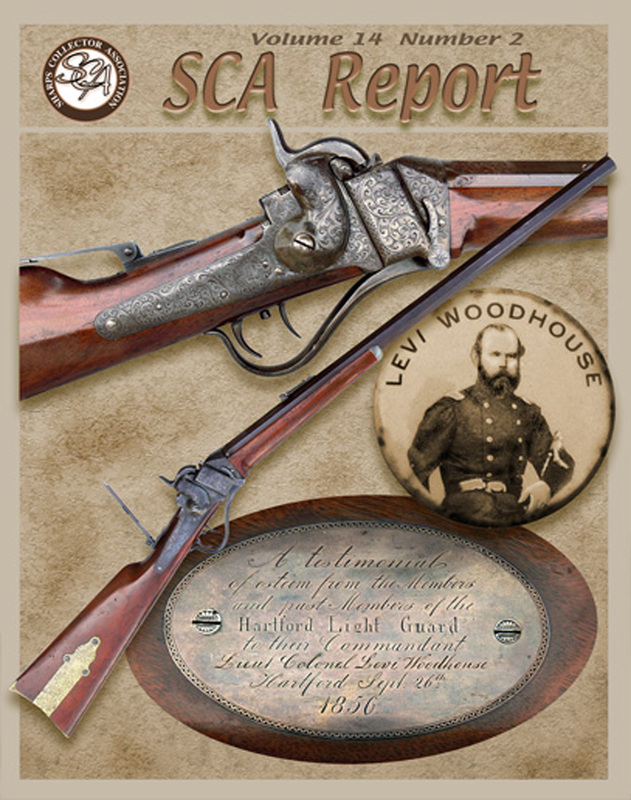 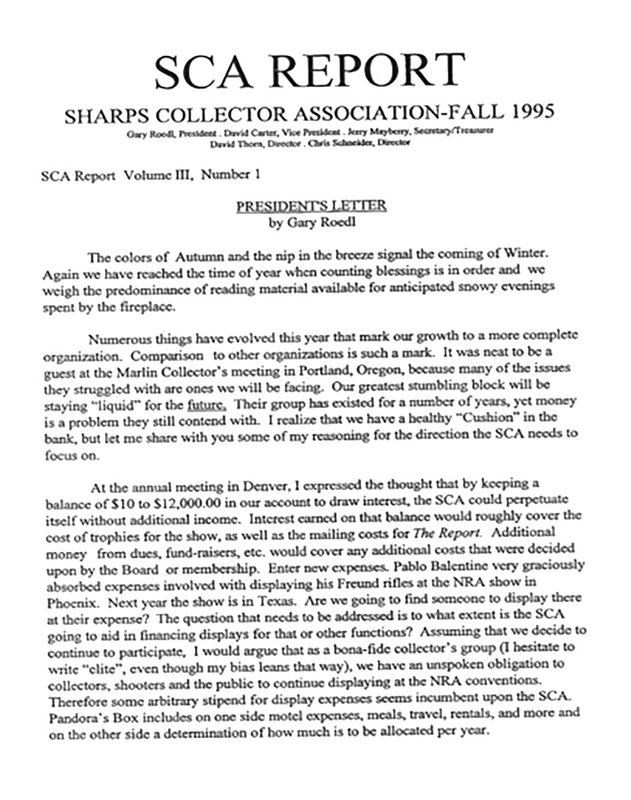 Single issues of the SCA Report are available to current members only. 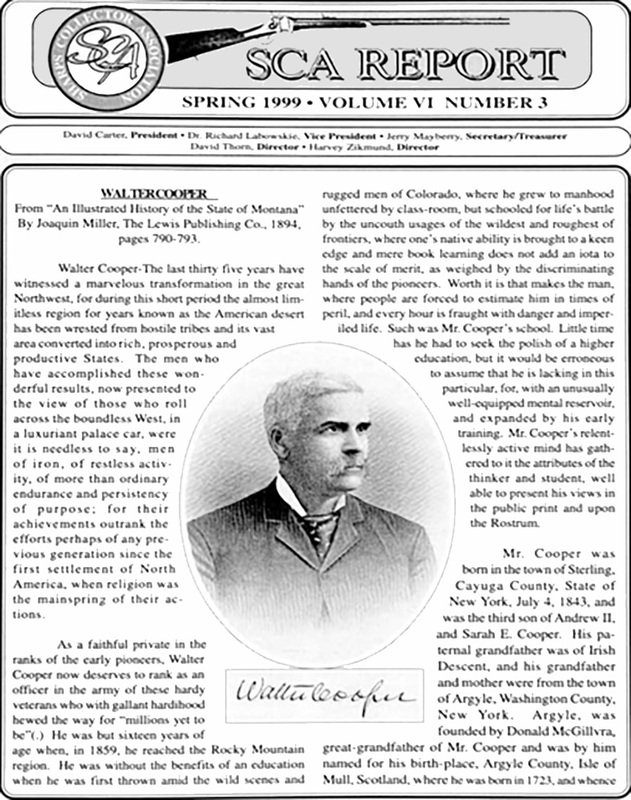 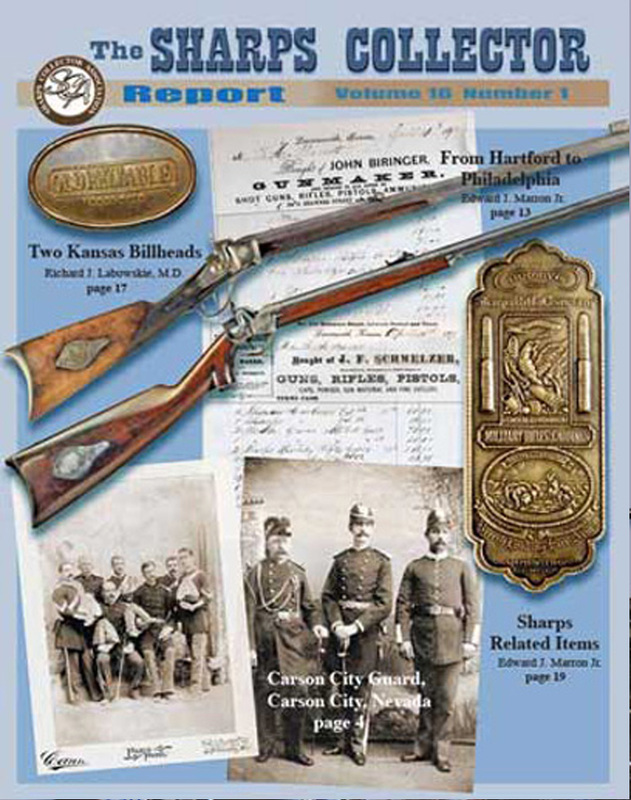 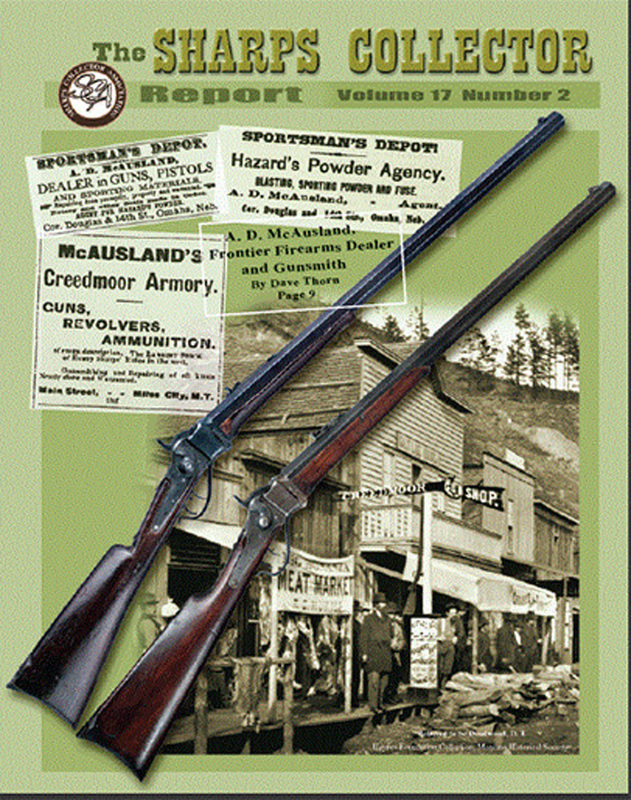 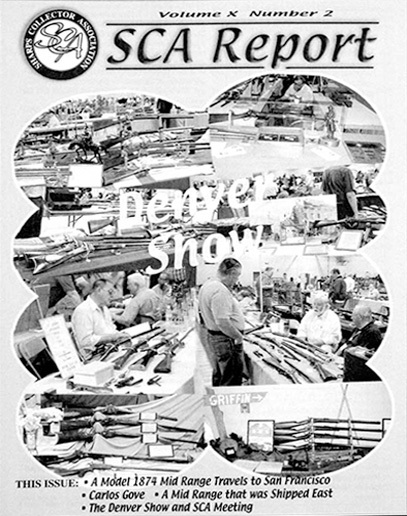 New members are encouraged to purchase past issues. 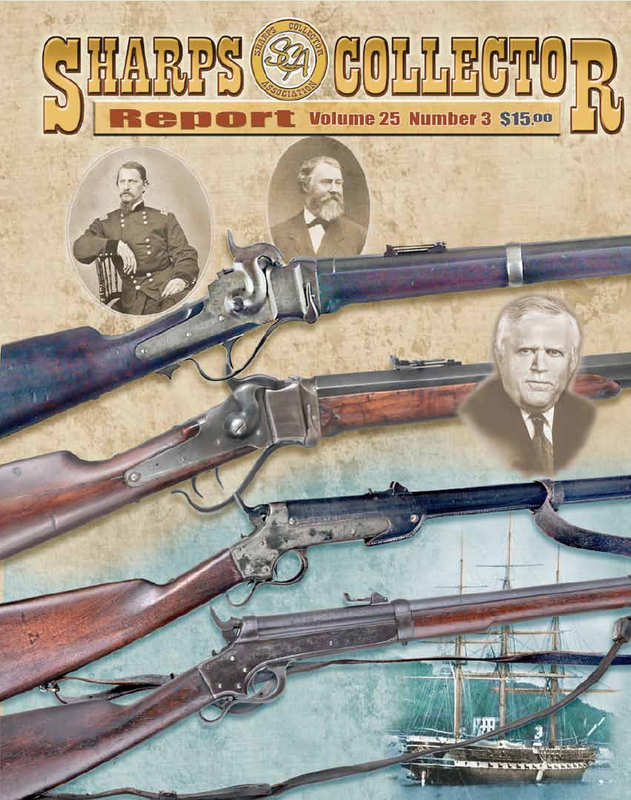 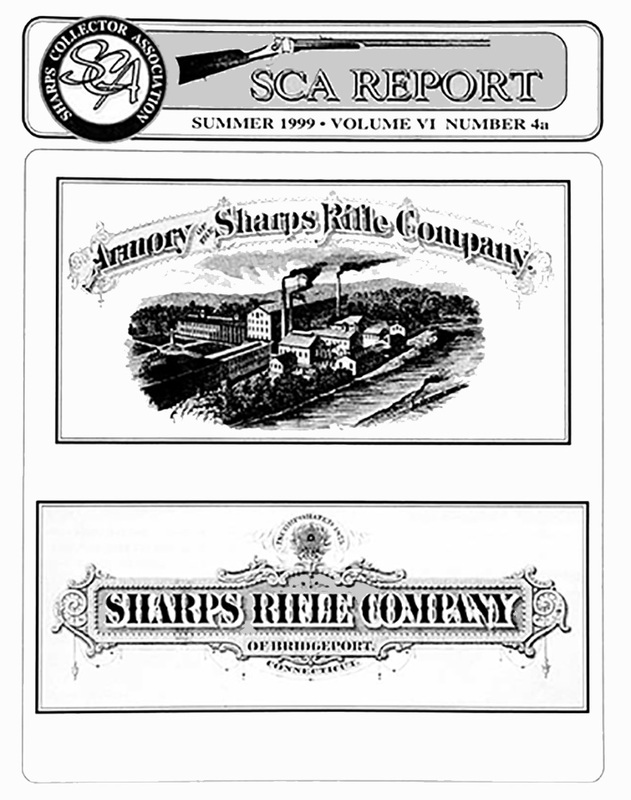 The Original Sharps Rifle Company Records by R. L. Moore, Jr., M. D.
Counterpoint by Robert C. Stump, M.D. 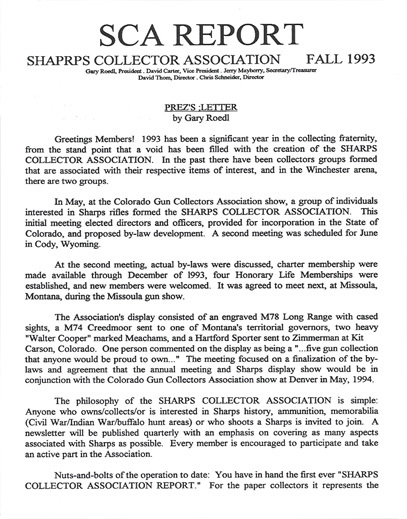 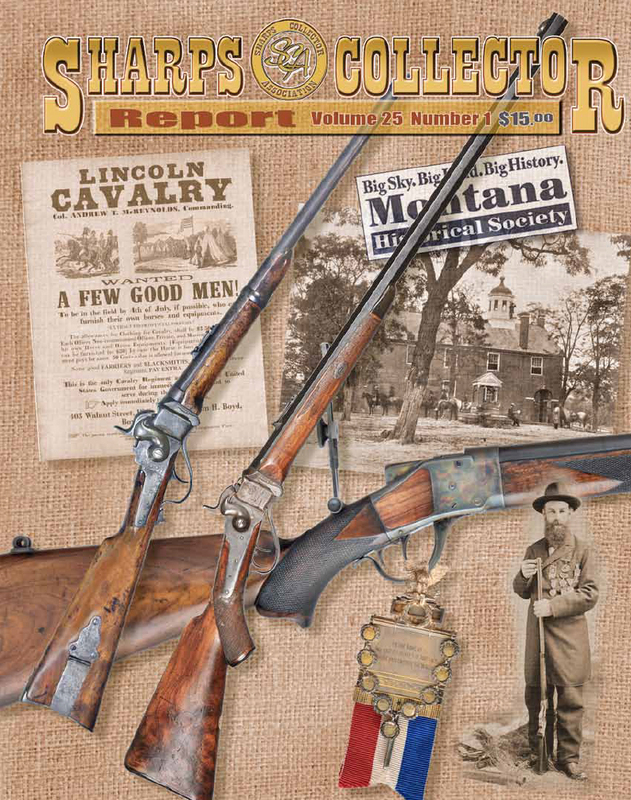 Sharps Long Range Promotional Item by Jim Gould, Jr.
After Fort Griffin by Jeff Price, M.D. 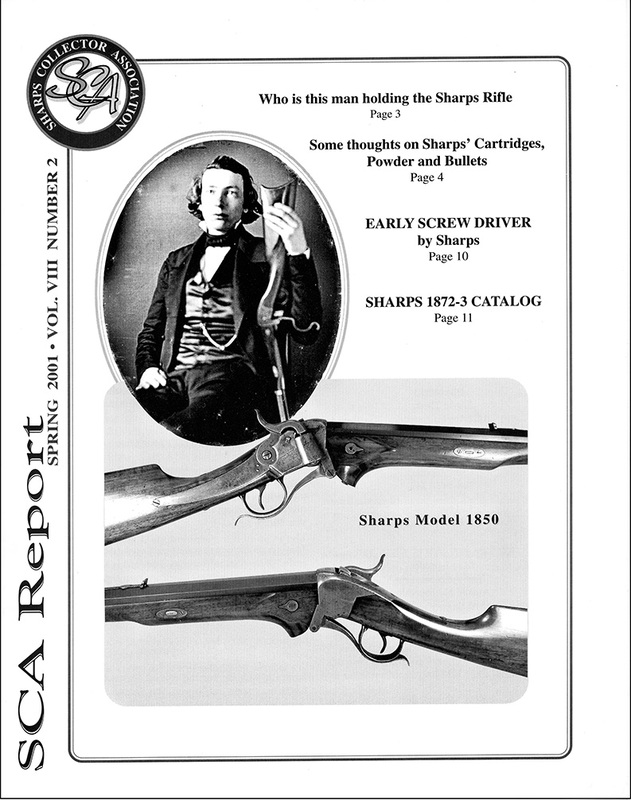 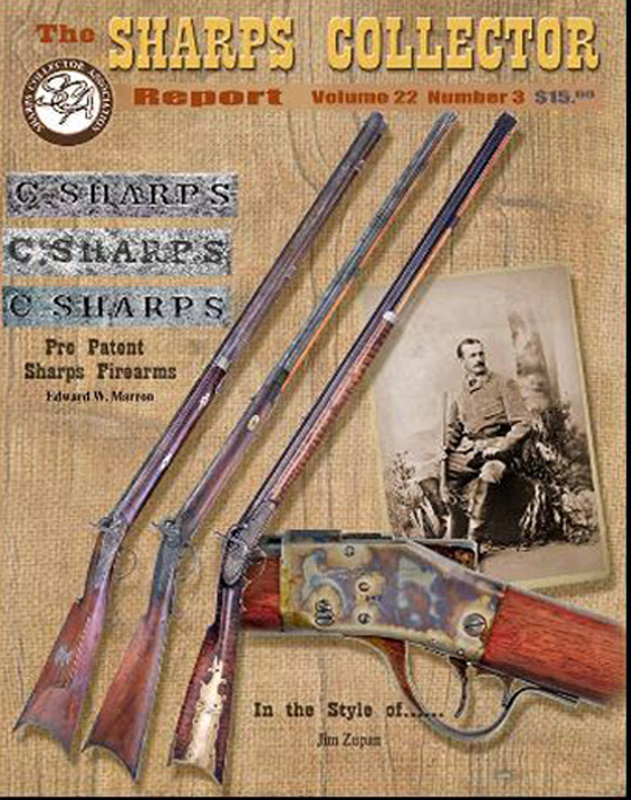 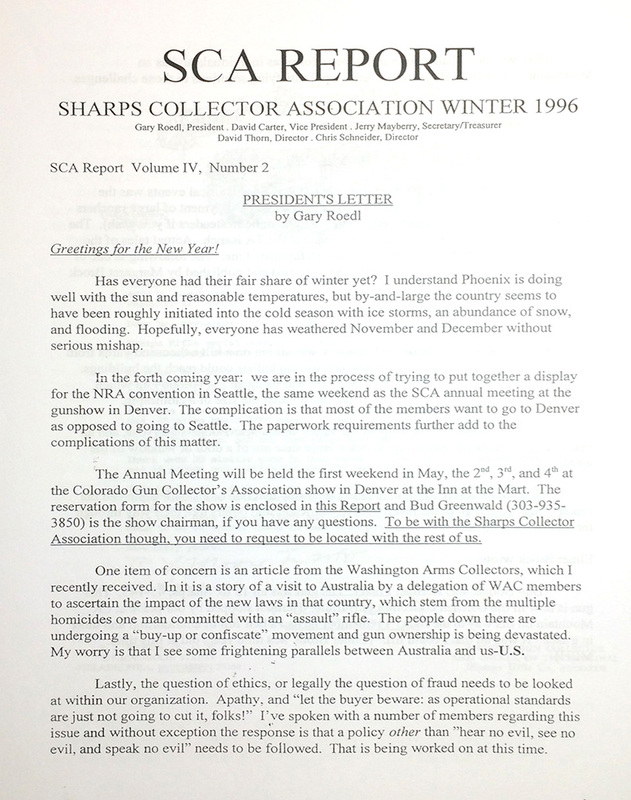 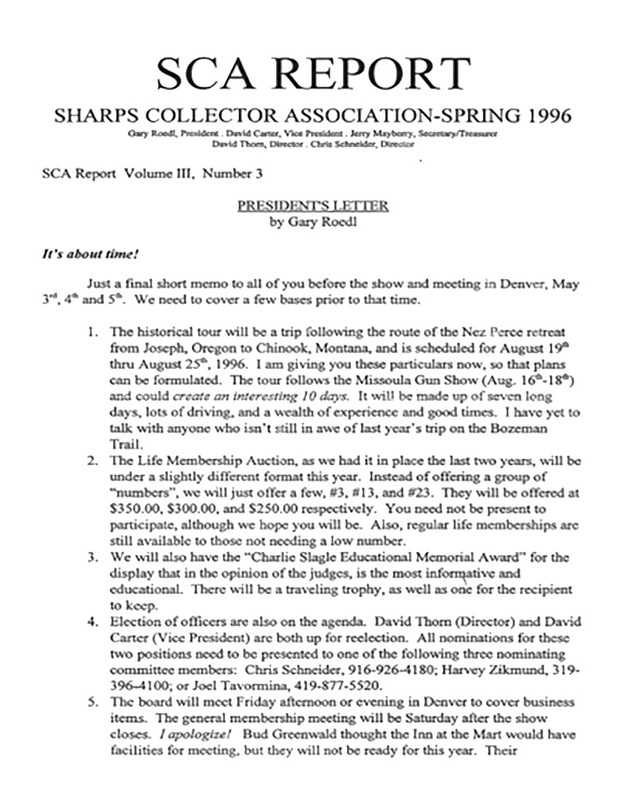 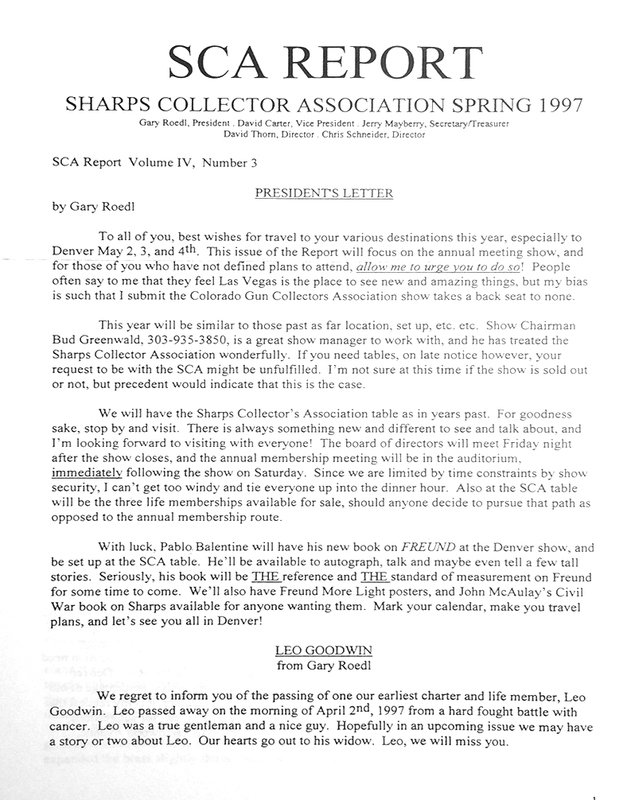 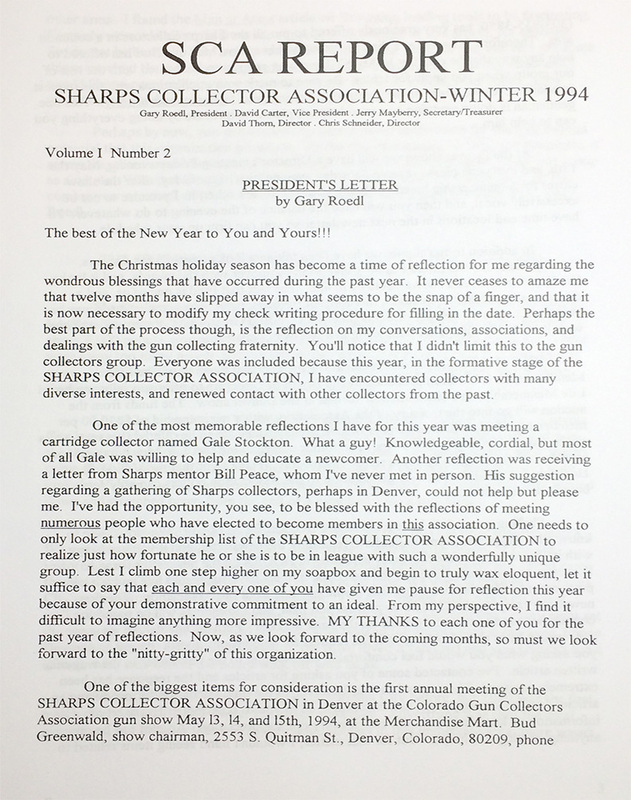 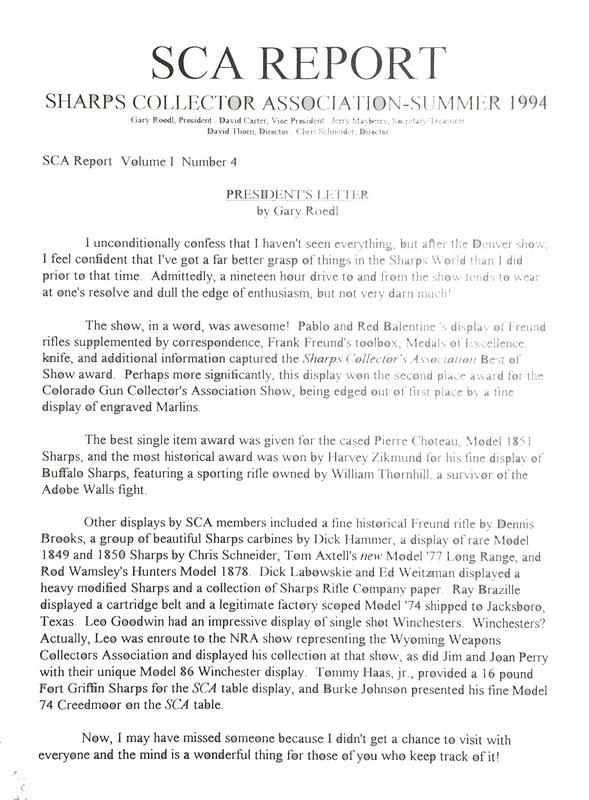 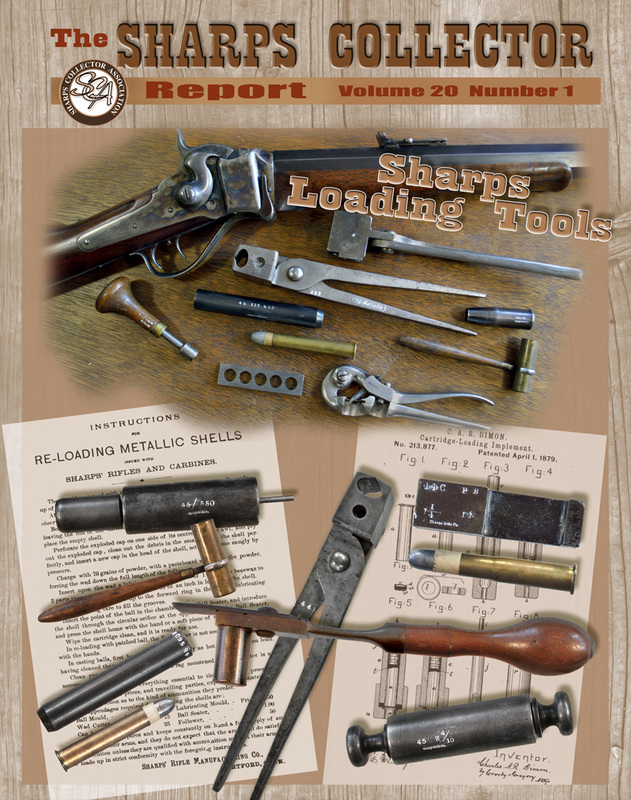 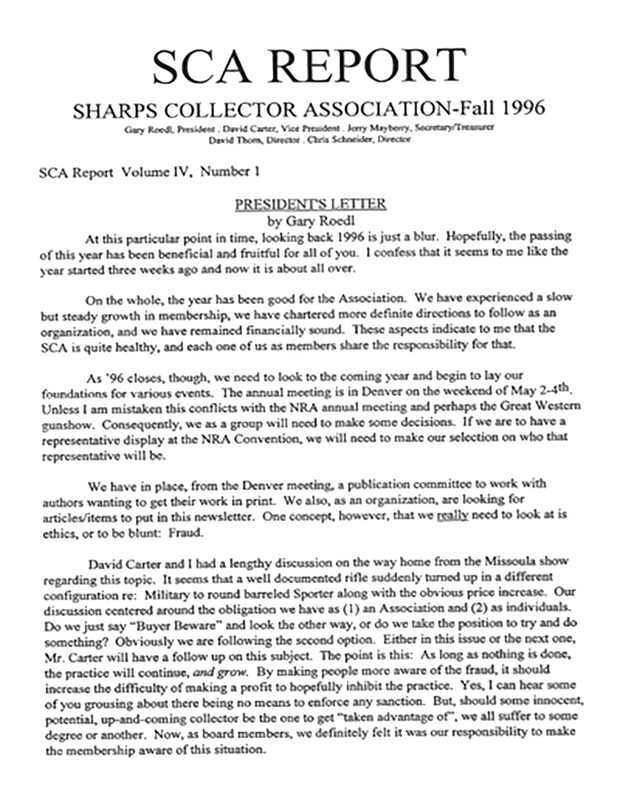 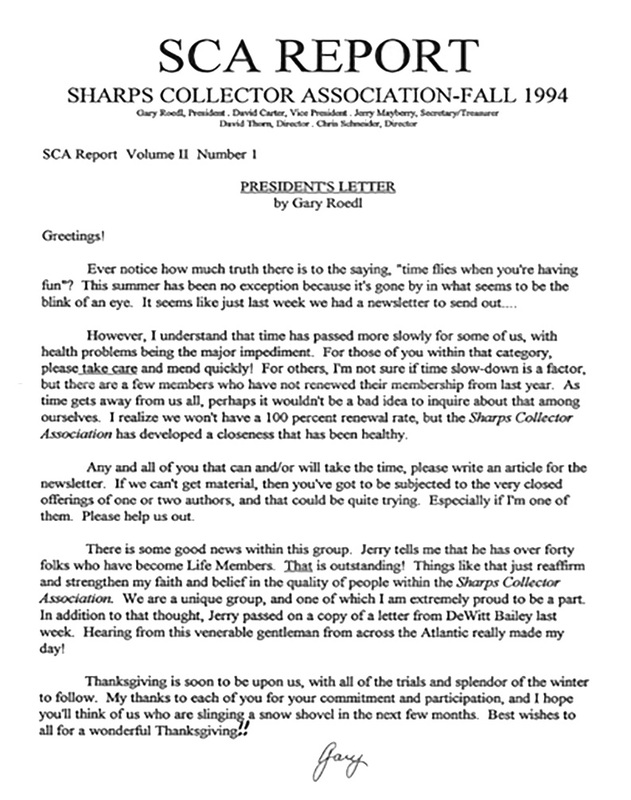 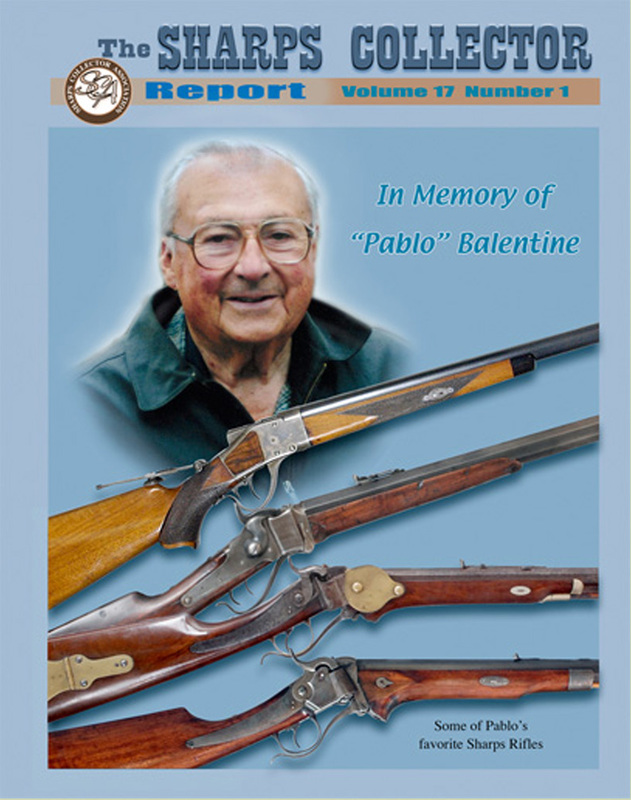 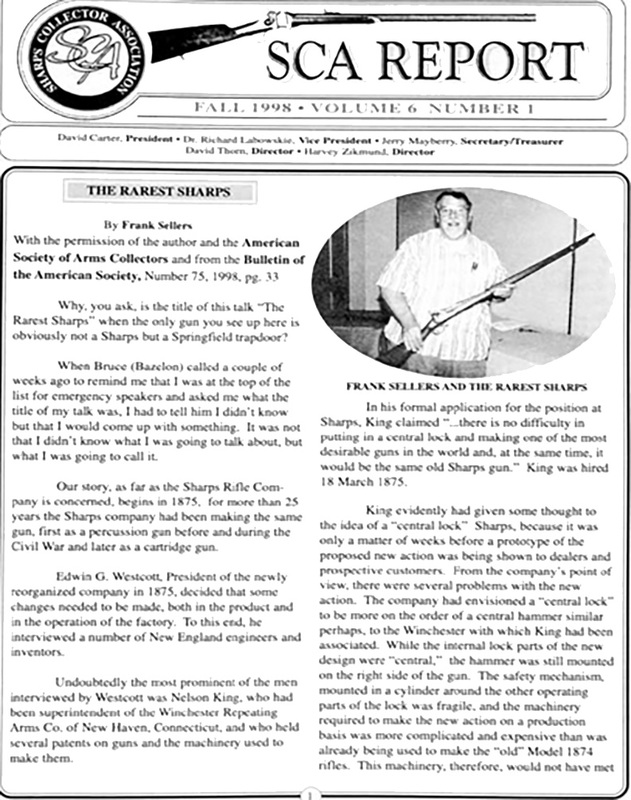 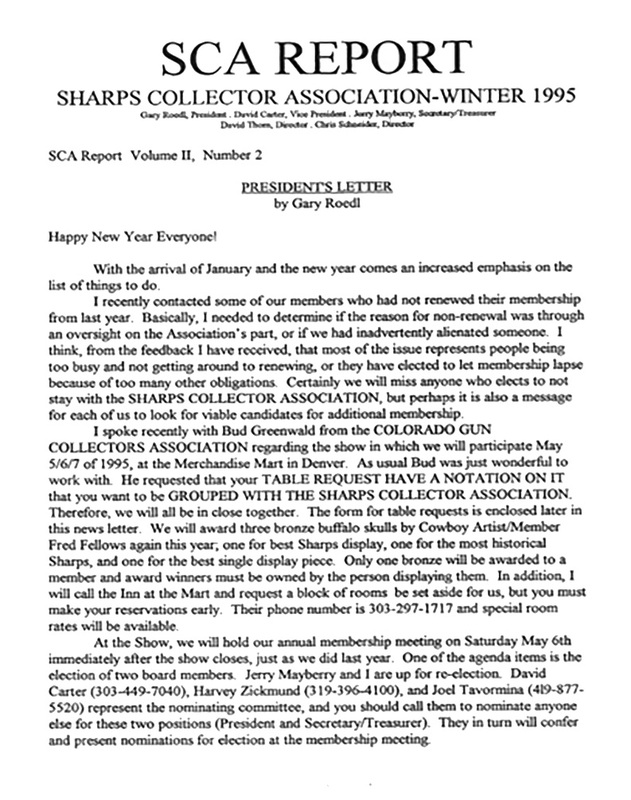 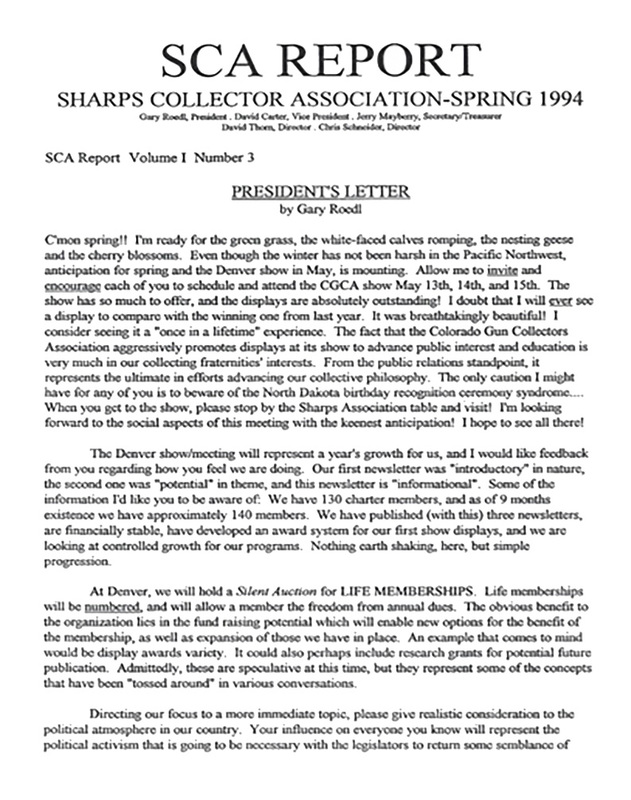 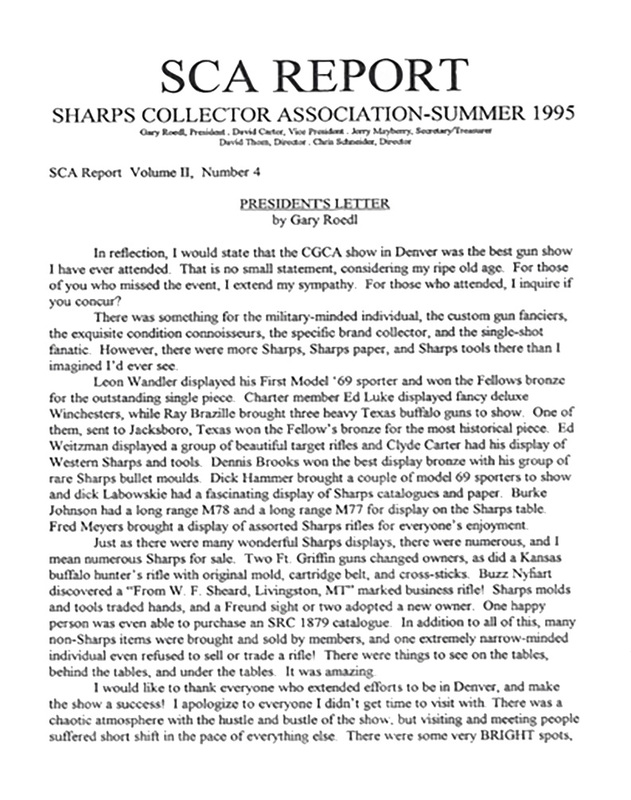 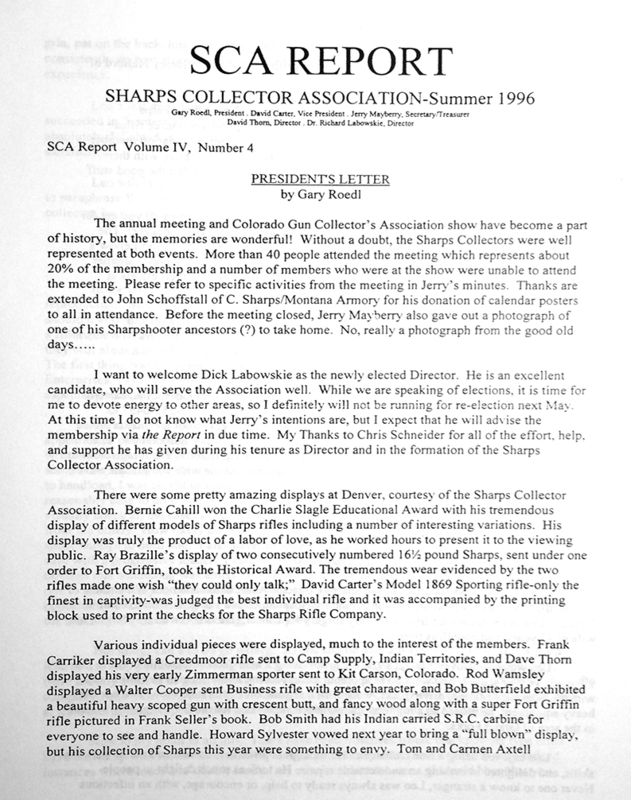 Remarks and Update on Sharps Serial Number Documentation by Richard J. Labowskie, M. D.
The combined issue, Volumes 9 No 3 and Volume 10 No 1 is $30.00 and out of print but available via e-mail at the same price! 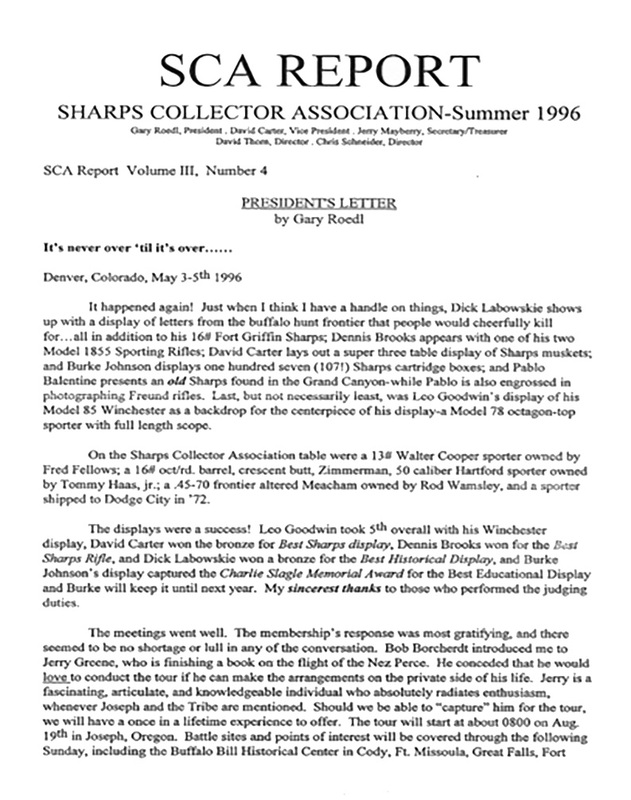 They then can be downloaded and printed out at office supply stores. 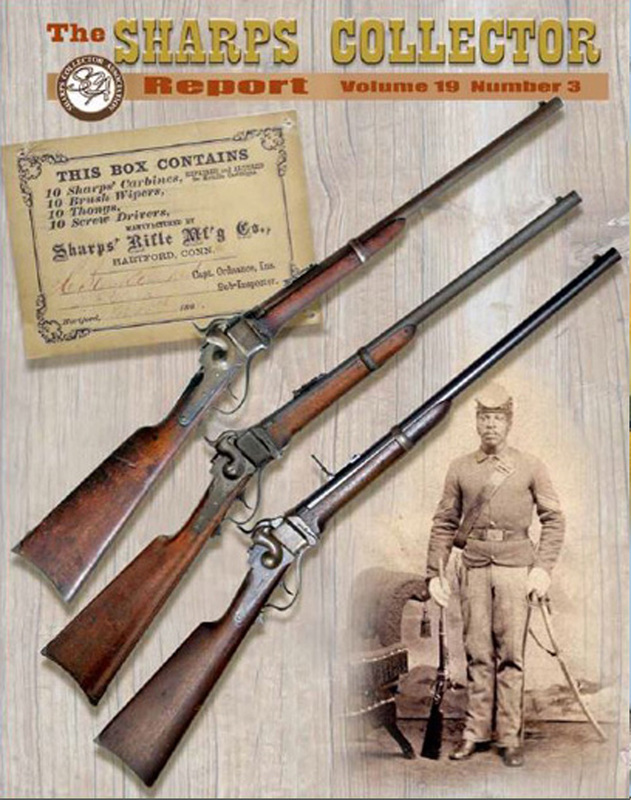 From Hartford to Philadelphia by Edward J. Marron, Jr.
Two Kansas BillheadsRichard J. Labowskie, M.D. 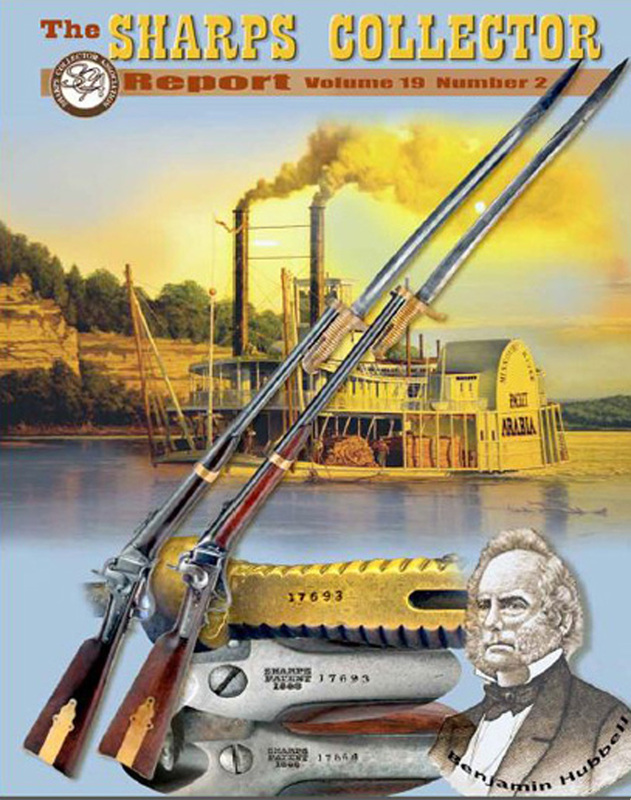 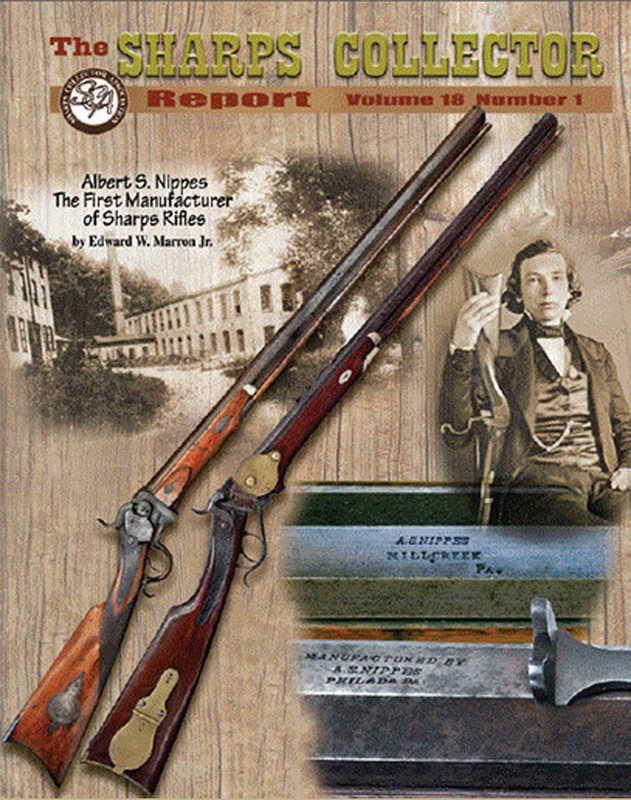 Albert S. Nippes Mill Creek Pennsylvania, The First Manufacturer of Sharps Rifles by Edward W. Marron, Jr.
Christian Sharps’ First Letter to the Secretary of War by Edward W. Marron, Jr.
Sharps Military Test and Trials 1850 – 1851 by Edward W. Marron, Jr. 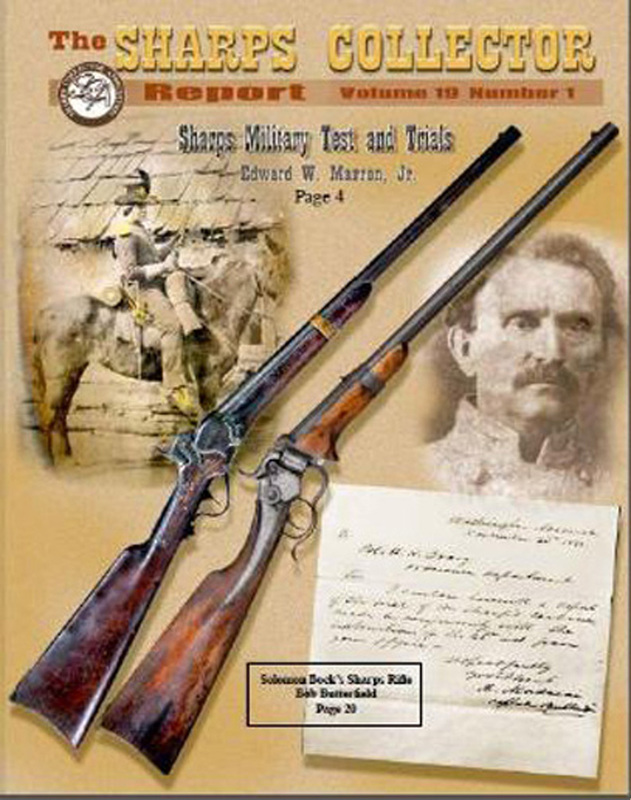 The First Sharps on the Texas Frontier by Edward W. Marron, Jr.
Matter of Forgery by Richard J. Labowskie M.D. 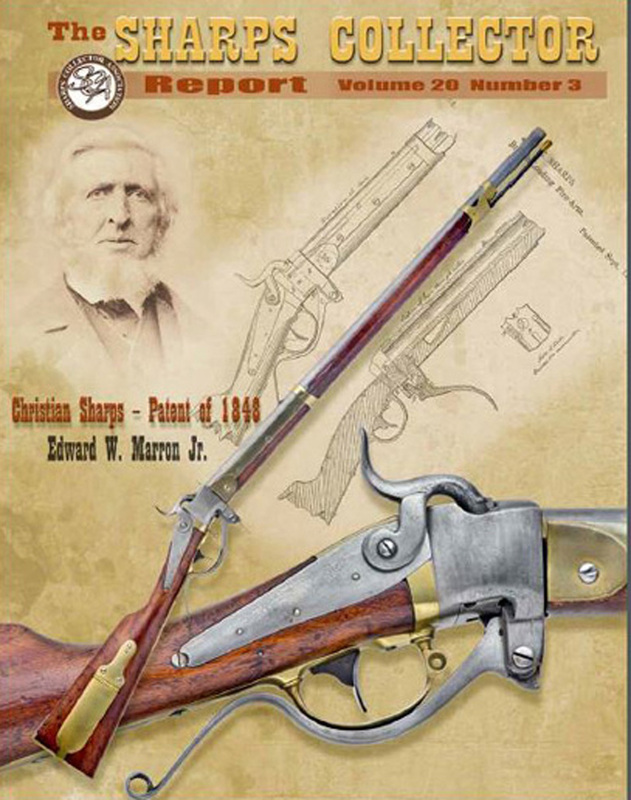 Christian Sharps – Patent of 1848 by Edward W. Marron, Jr.
Sharps Patent of November 11, 1856 by Michael Rector, Ron Paxton, and Edward W. Marron Jr. 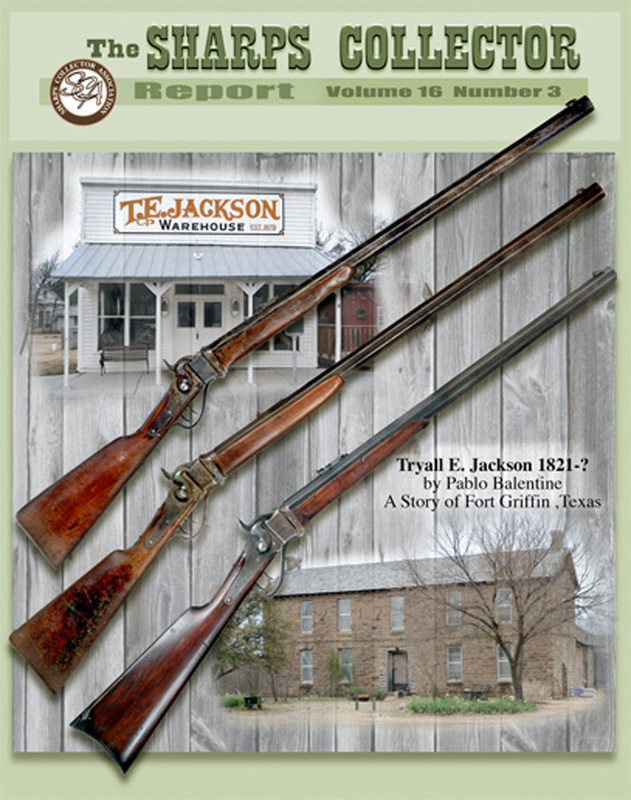 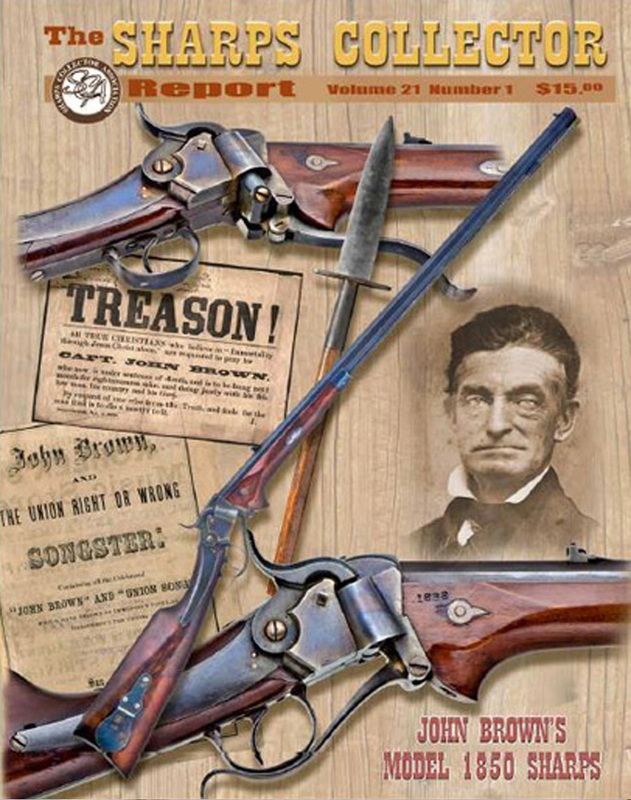 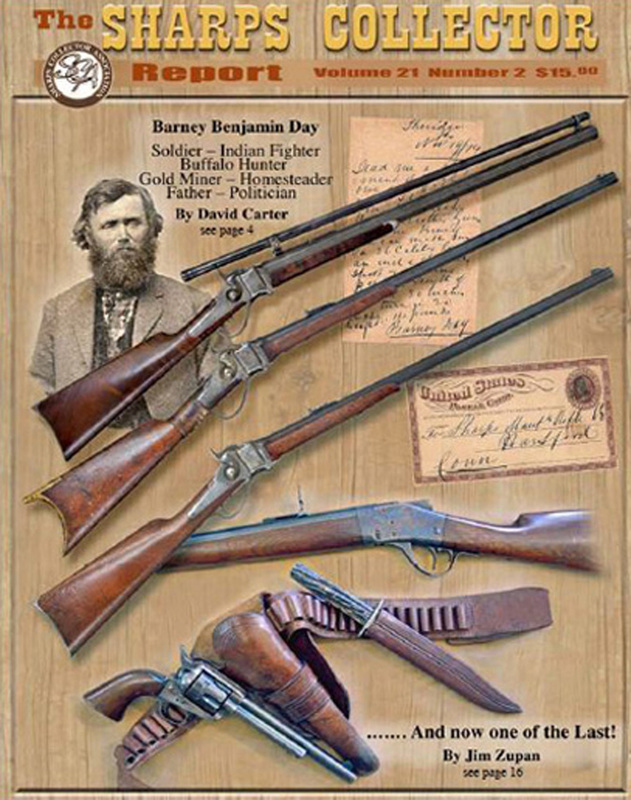 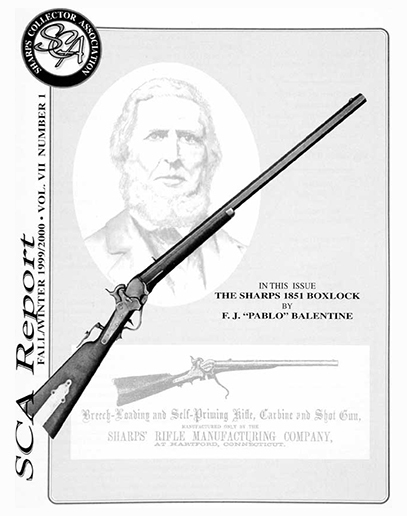 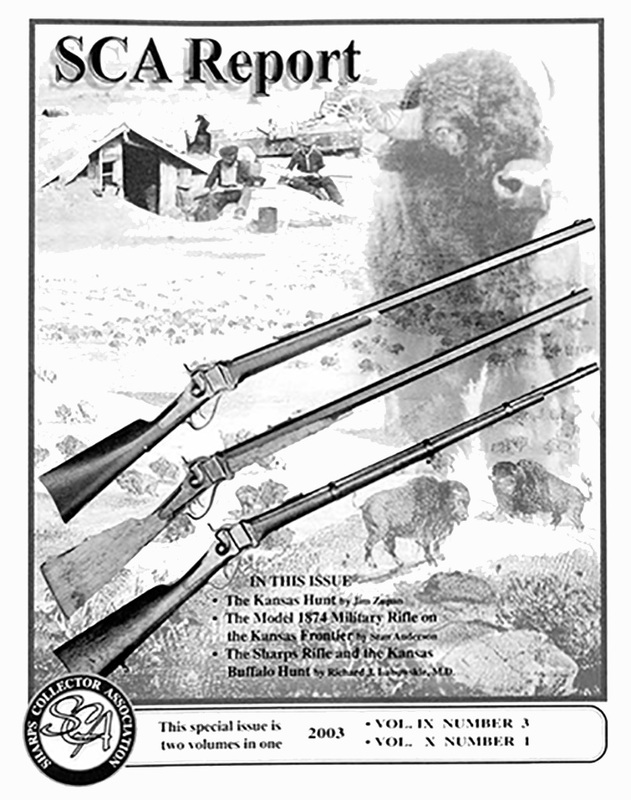 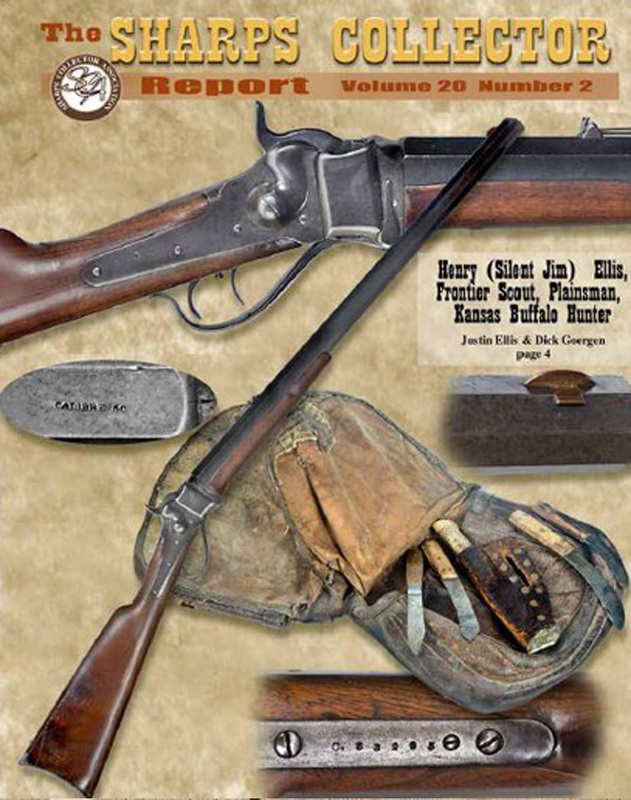 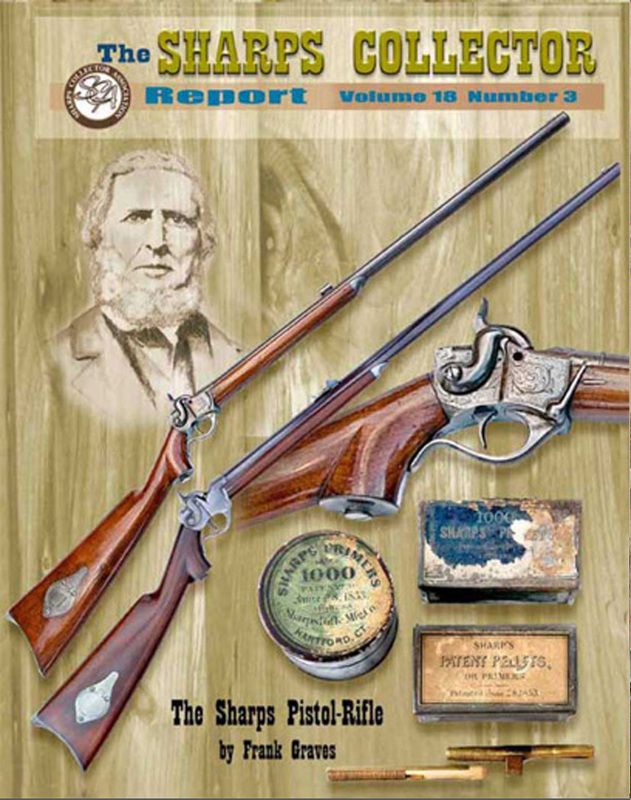 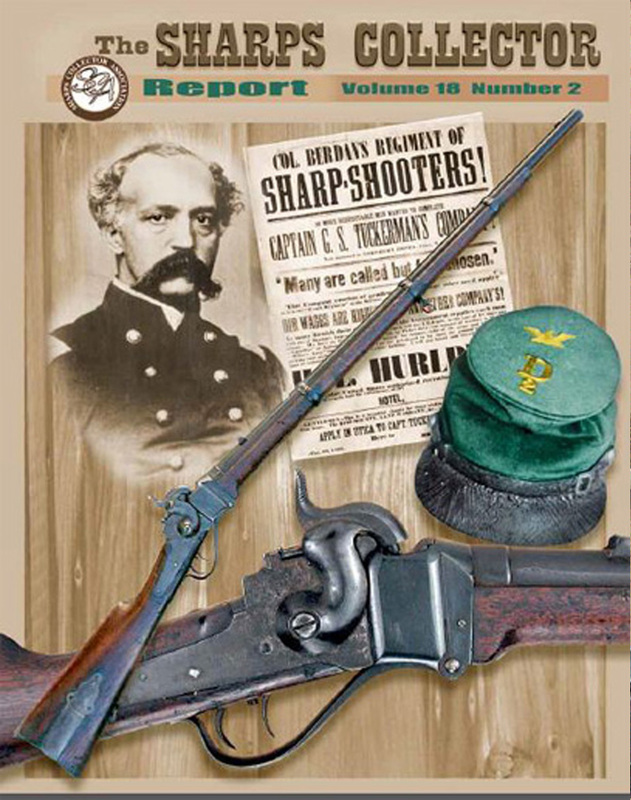 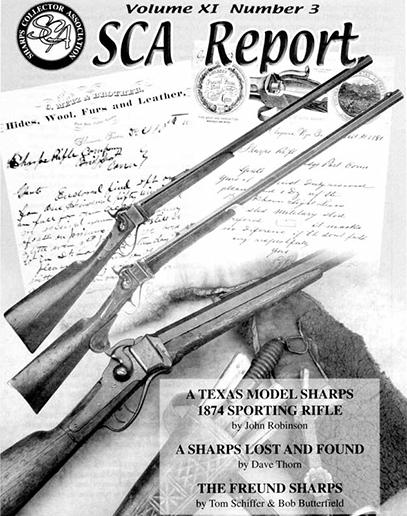 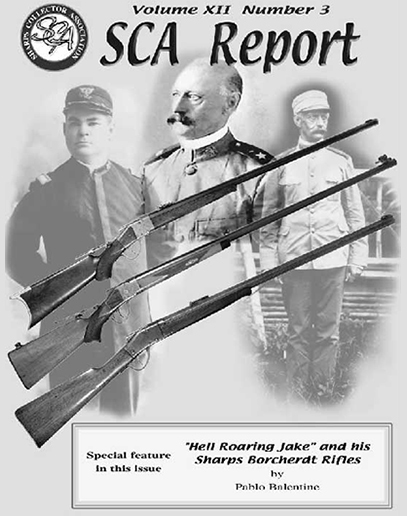 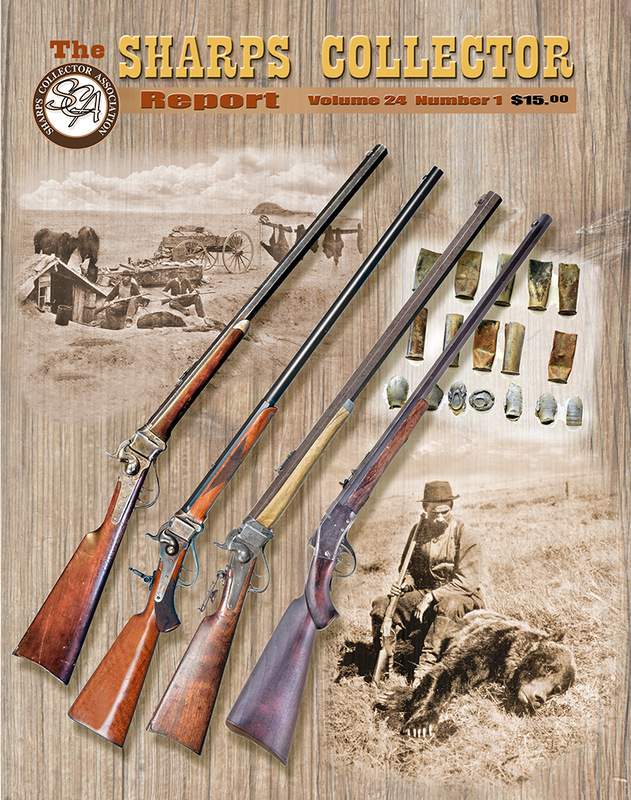 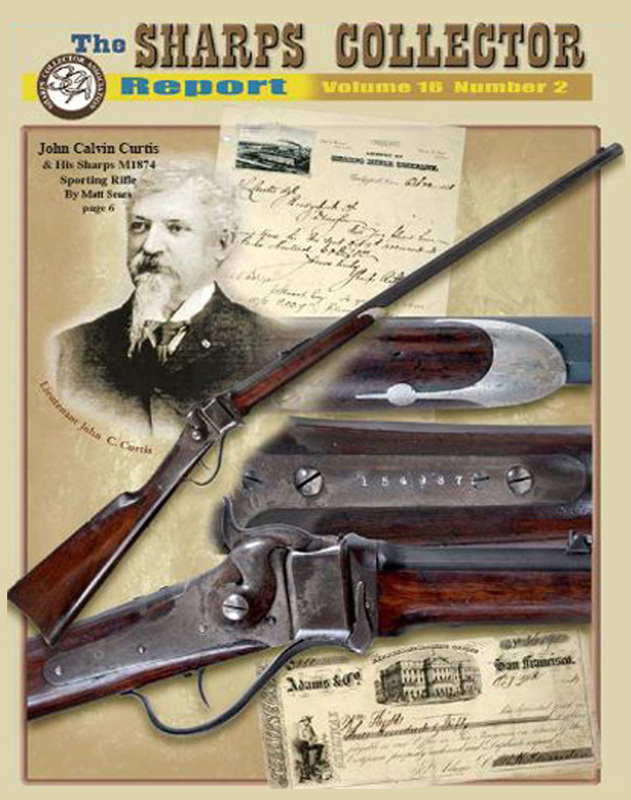 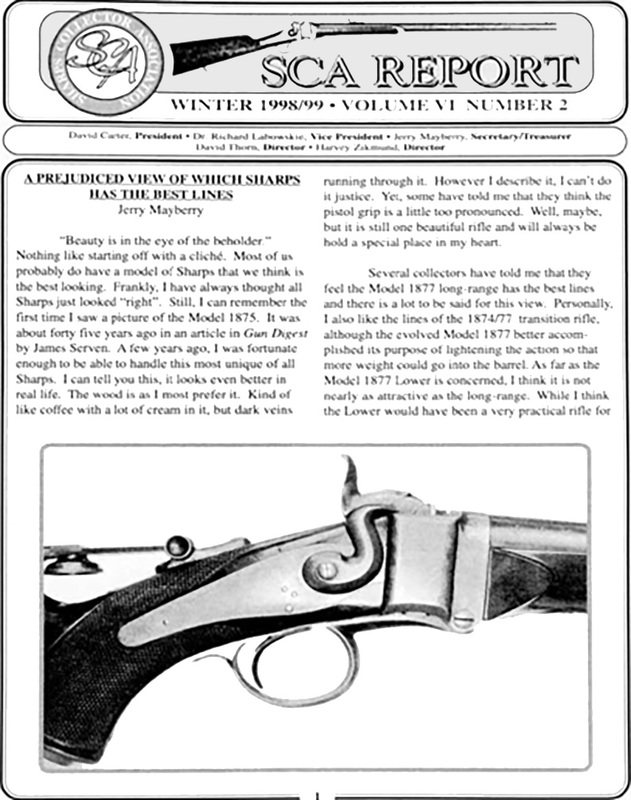 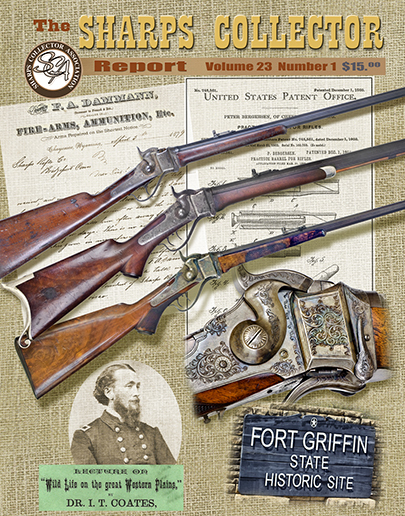 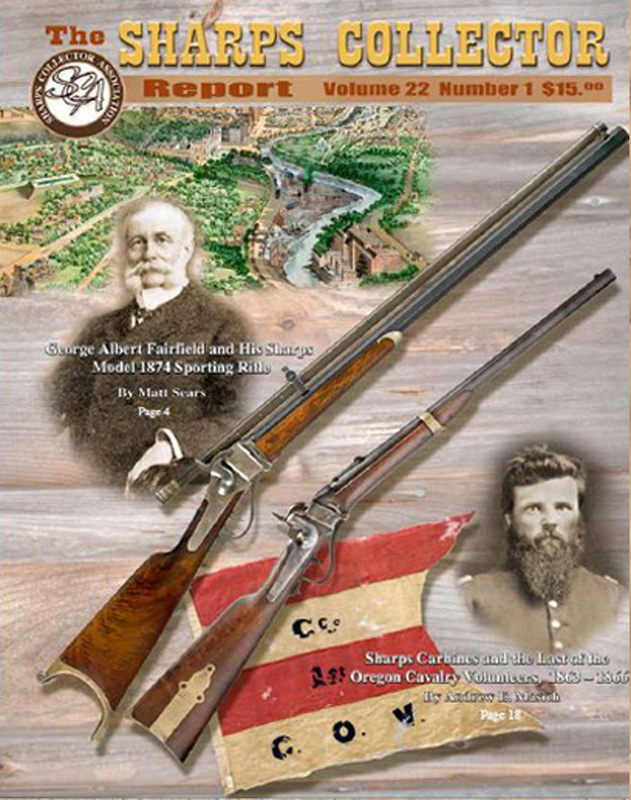 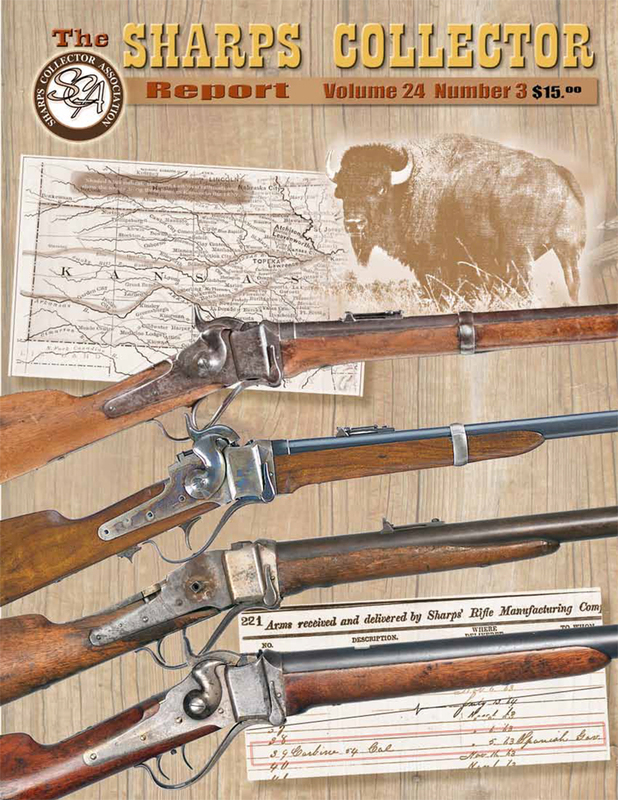 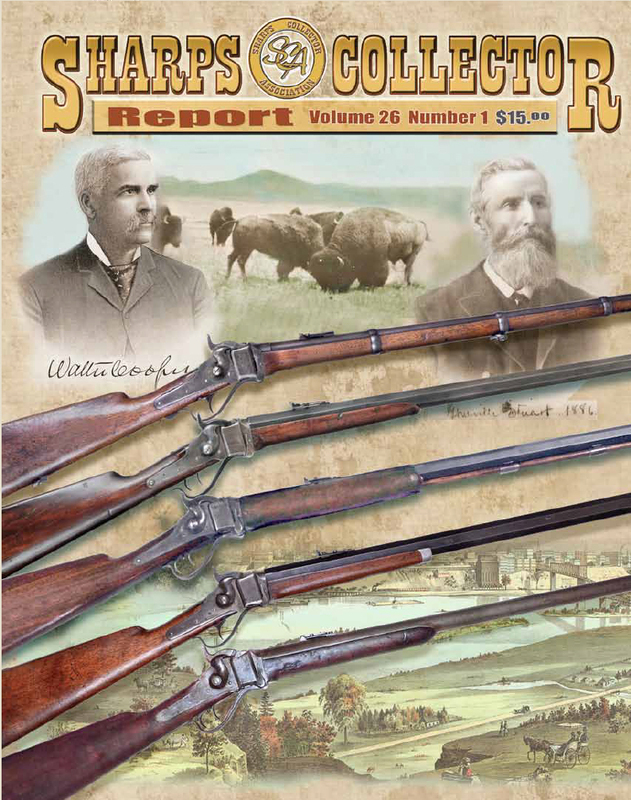 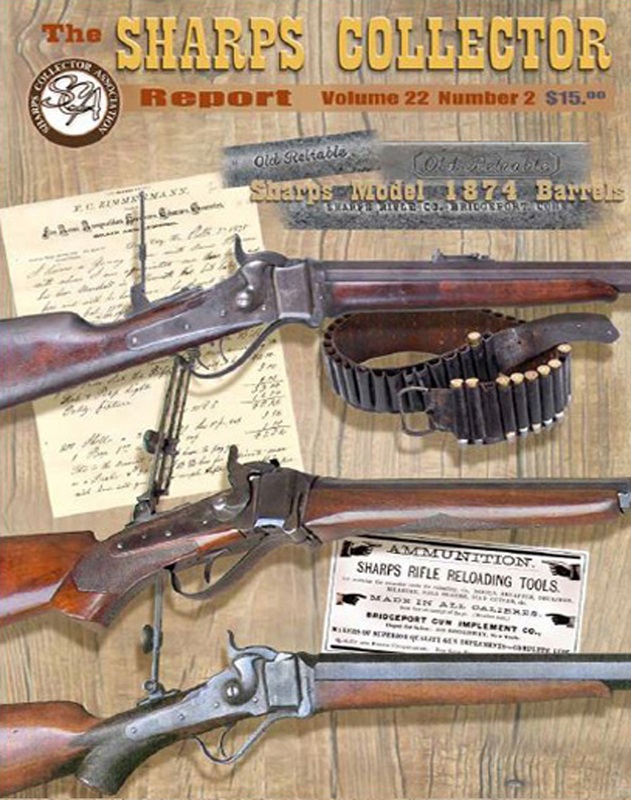 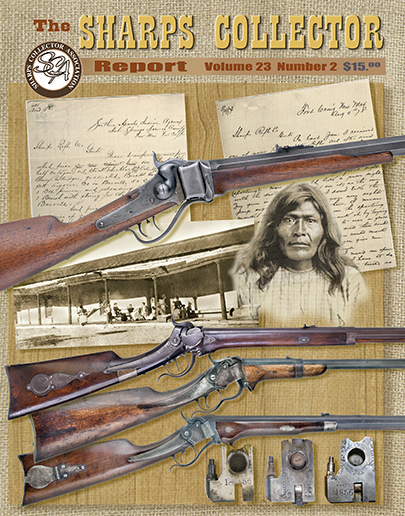 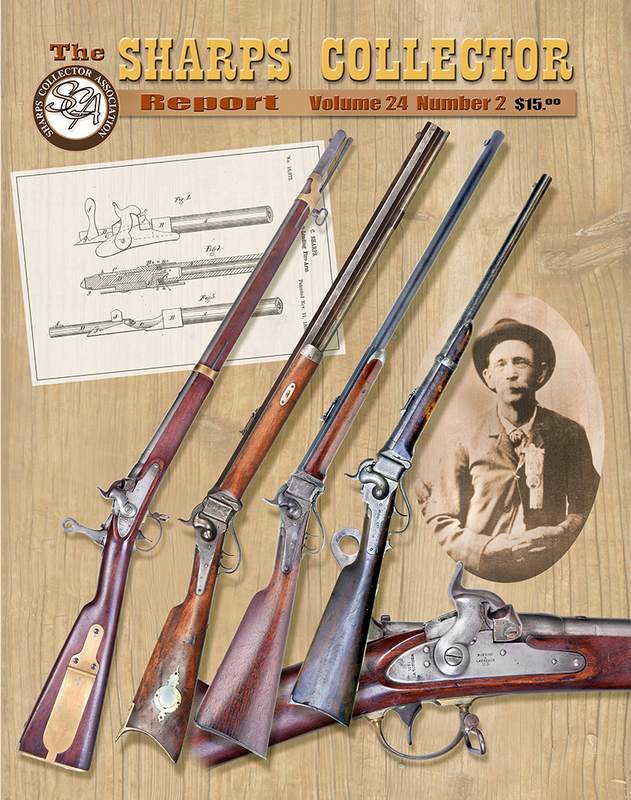 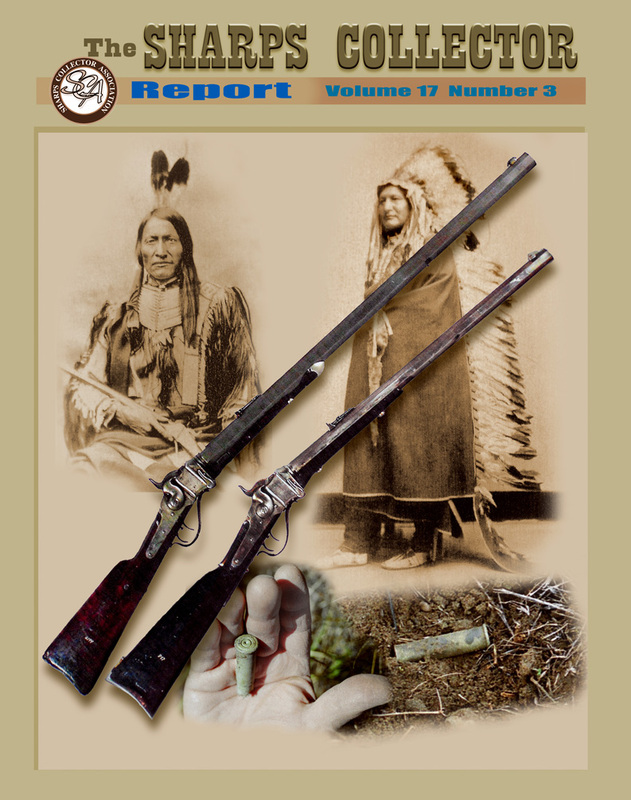 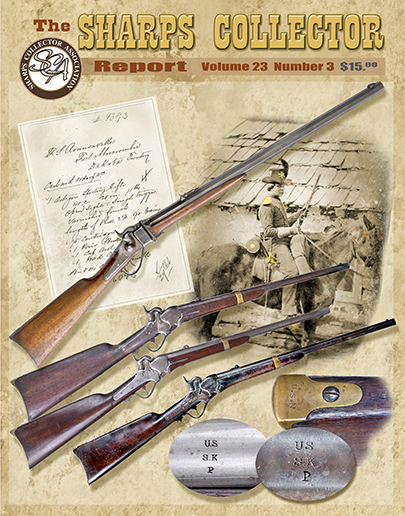 The Sharps Rifle and teh Kansas Buffalo Hunt by Richard J. Labowskie, M.D.